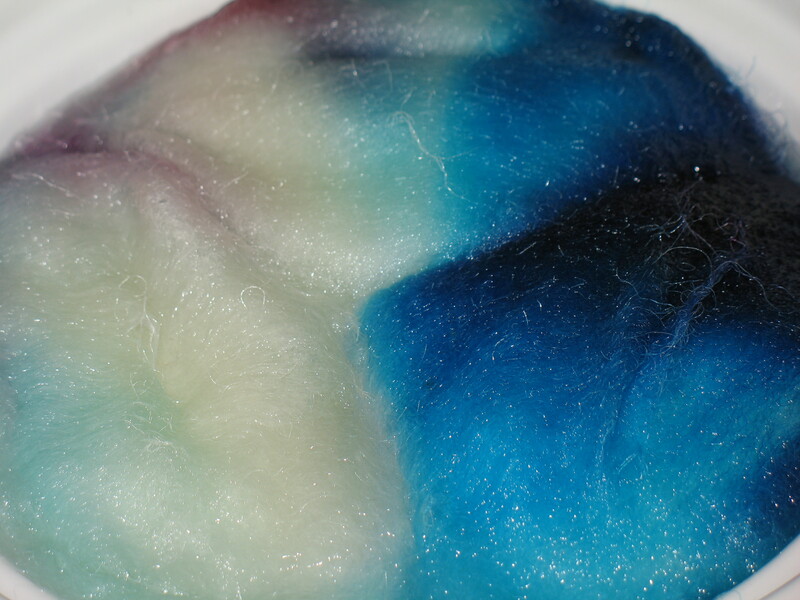 Fiber Adventure Week – Blog Candy Time! So, I’ve been rounding up treats! I thought about putting together just one big package, but decided it’s more fun for everyone if more than one person gets a something, so I have lots of smaller packages instead. 🙂 First, though, I want to tell you how to get into the drawing. It’s easy, but if you don’t follow the rules, you won’t be included! 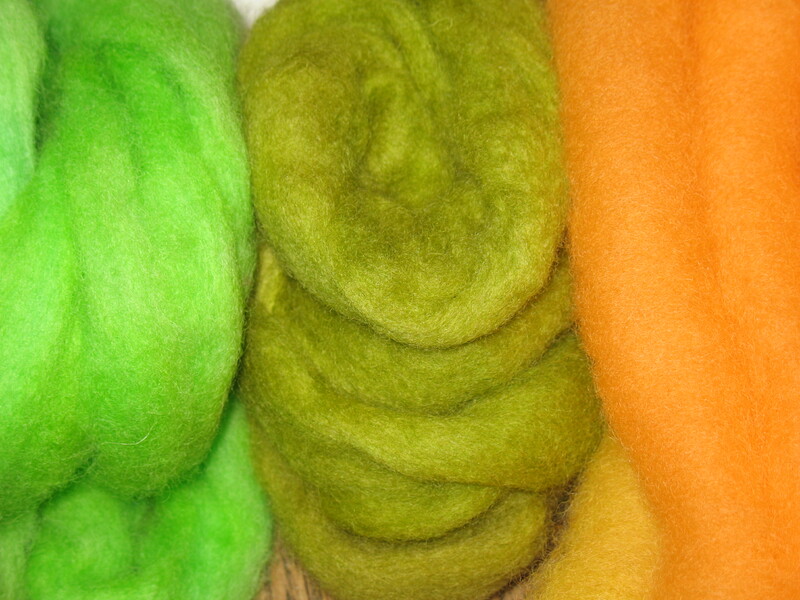 Look back through the Fiber Adventure Week/Weekend posts and scroll down this entry to see the prizes. If you could have come to my house and joined me for ONE activity, which one would you have chosen and why? What candy do you want to have the most? Prioritize first, second, and third choice. That’s all there is to it! Post and answer the questions, and your name will go into the drawing! Since this is a holiday weekend, I know many of you will be busy for the next few days, so I’m going to make the deadline for entering the drawing next Wednesday, April 27, 2011 at midnight EDT. That gives you 4 days to see the post and enter. I’m going to show you all the candy options, BUT the actual number of recipients will be related to the number of entries I receive. 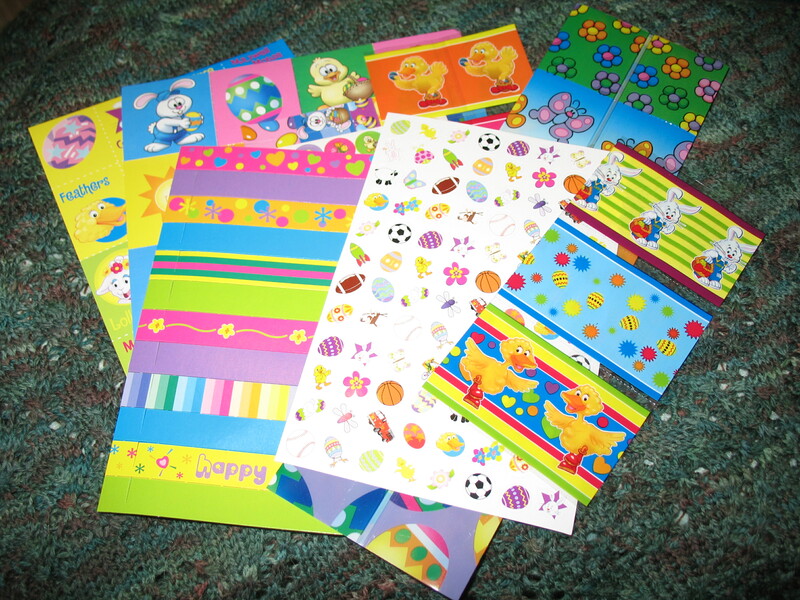 For every group of up to 3 entries, another winner will be chosen – up to the point that I run out of gifts. So if there are 1-3 entries, one package goes out, and if 4-6, there will be 2. 13-15 would mean 5, and so on. Hopefully that makes sense. So without further ado, does anyone want one of these? 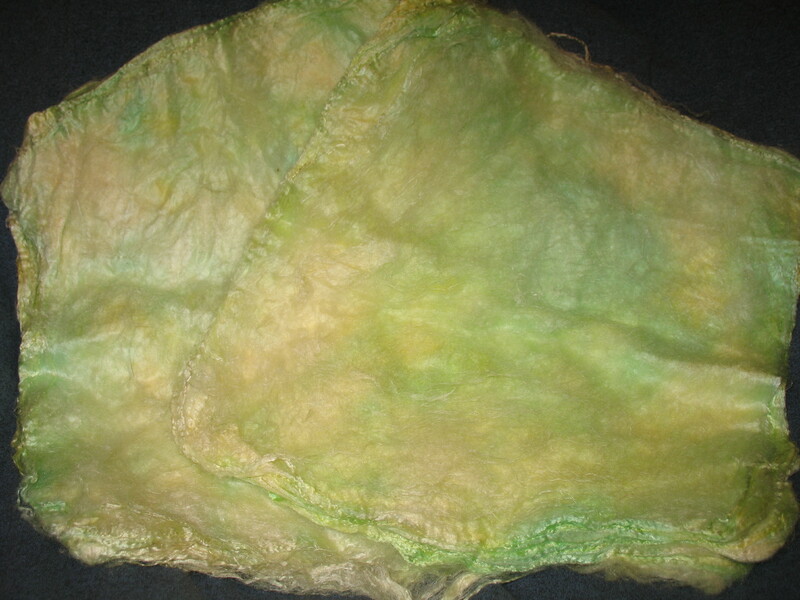 About 18.5 grams of hand-dyed, soft yellow and green mawata (silk hankies). Should be enough to make a little pouch or similar sized item – or to just play and learn. Remember, although you can spin lovely, fine yarn with this, you can knit straight from the hankies as I showed in a post a few days ago. I’m eager to start on my part of the stack. These are really pretty in person. 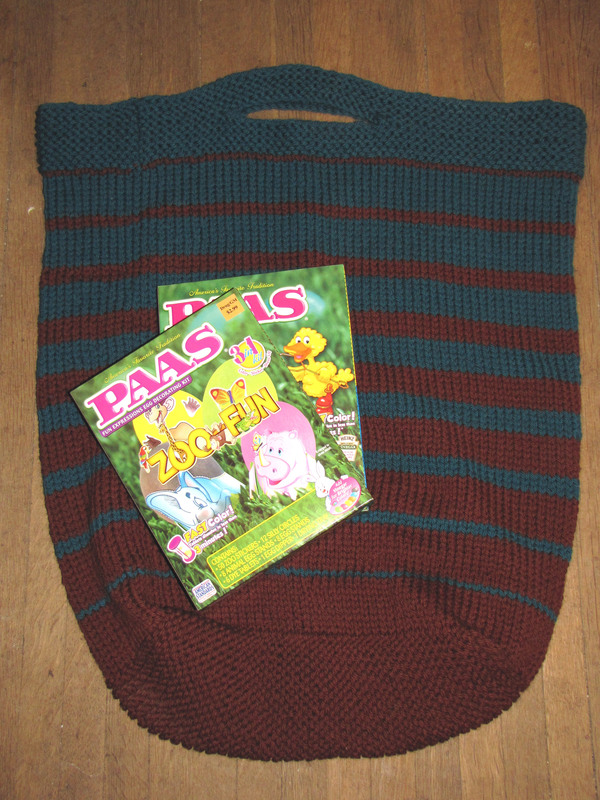 A small stack of mawata (silk hankies) and a 6-color Paas Classic egg dyeing kit. 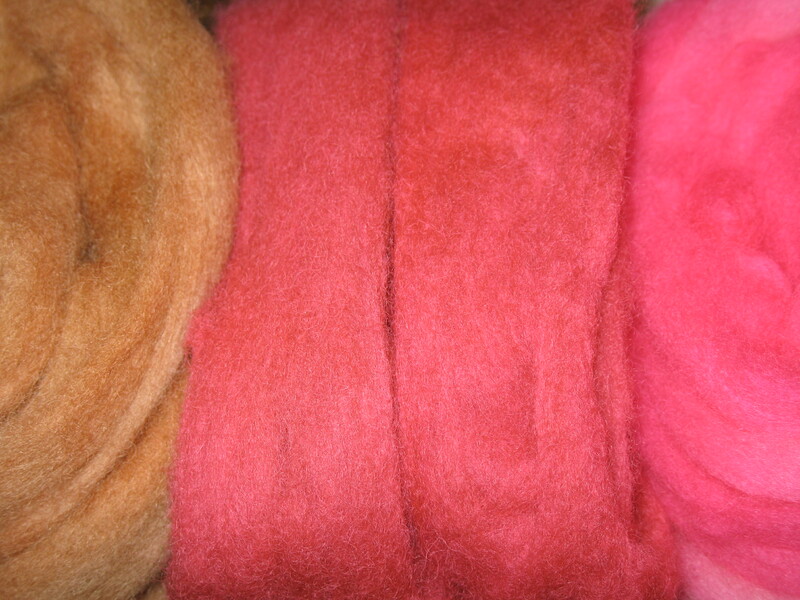 Again, this should be enough silk for a small project. 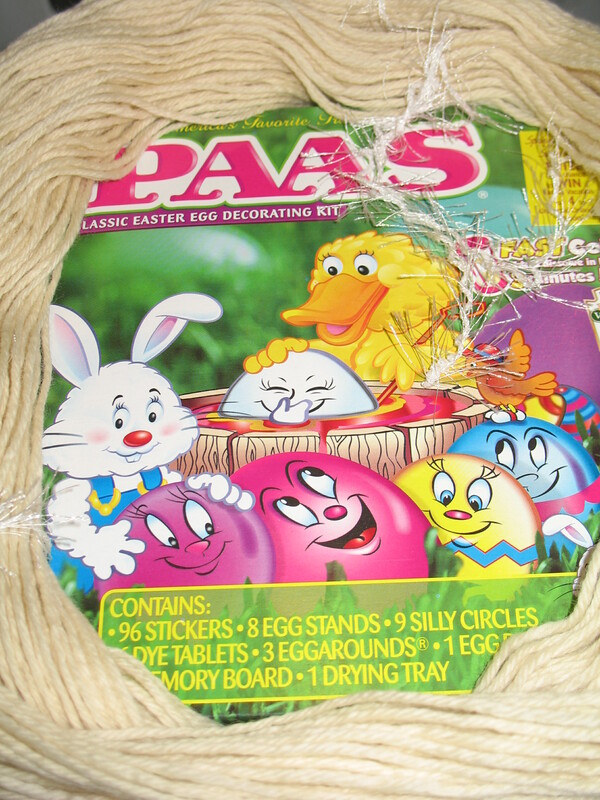 Six ounces of Corriedale roving and a 6-color Paas Classic Easter egg dye kit. 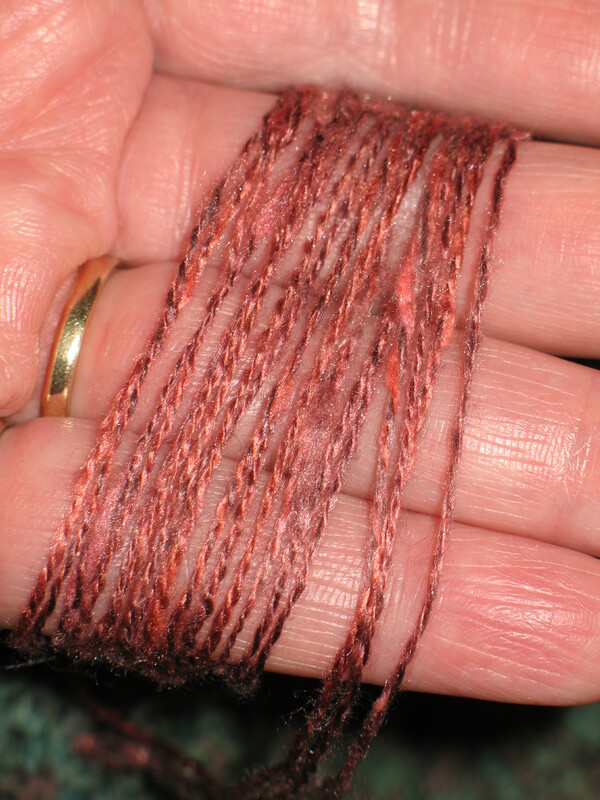 Dyed and spun, you can do a lot with this much, but it is also enough to make at least 4 rug mugs. 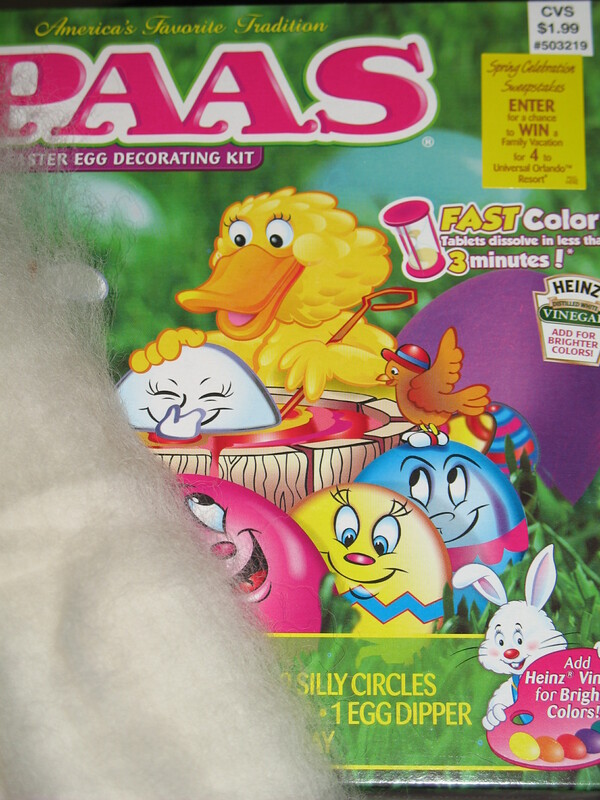 A skein of unbranded, worsted weight wool yarn, ready to dye and a 6-color Paas Classic Easter egg dye kit. Best estimate is that this is about 220 yards, but that IS a guess! 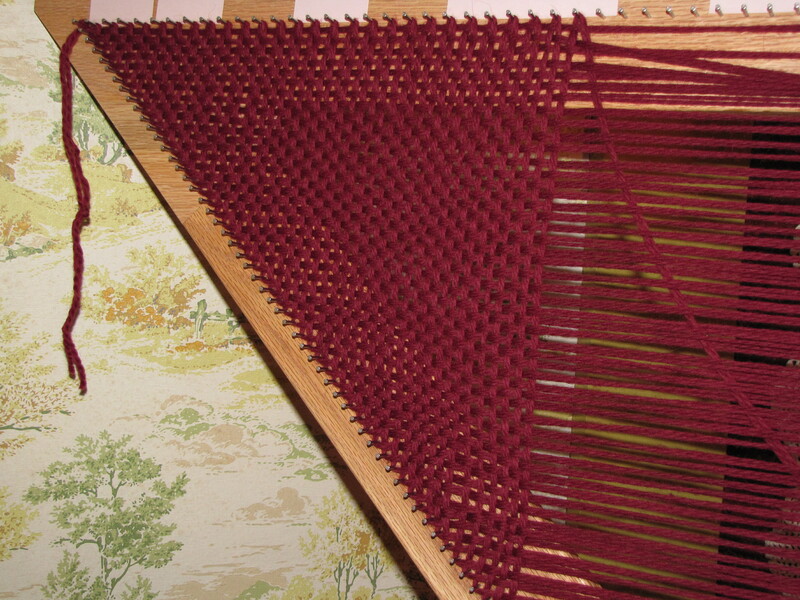 It might be fun to weave with this on a small loom after it’s dyed, but of course, it’s great for knitting or crochet or whatever else you love, too. No photo for this one, but you can look on Ravelry (link in sidebar) to see them all – one download copy of your choice of my individual patterns or $10 off the Concerto Tutorial book download. Okay, I think that’s it! I need to get this published and go check on my dye pot! Thanks again to you all for joining me in this incredibly fun week! BLOG CANDY – NEXT POST! Not surprisingly, I slipped quickly into overdrive when I got home. I had about 4 days worth of stuff I wanted to do, and only one in which to do them. 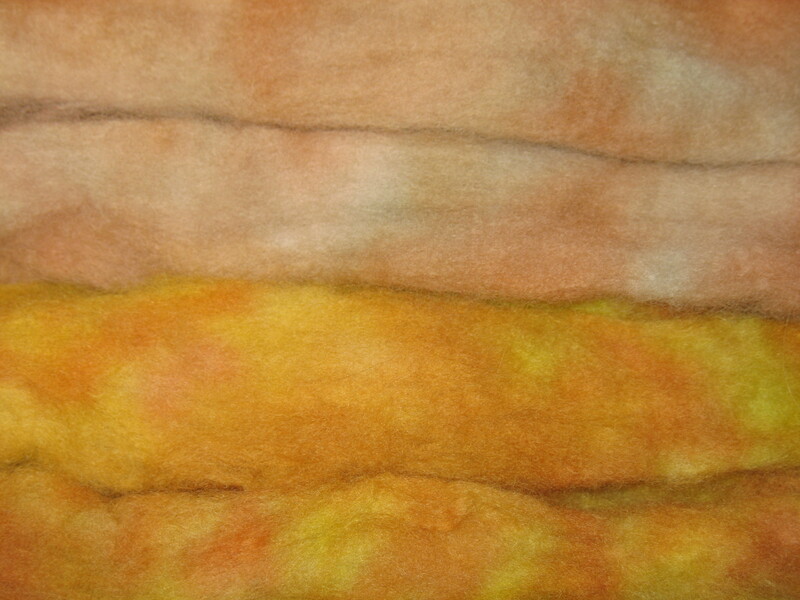 After I started a dye pot going, my first order of business was some fulling (aka felting). I really wanted to see what I could expect from the square I wove a couple days back, and since I was going to be filling the washer with hot water and agitating anyway, I decided I should go ahead and toss in my second Angela’s Fabulous Felted Bag, which I’ve christened “Needlenut” in honor of the spruce and hazelnut colored Wool of the Andes Bulky I used to knit it. I’d been holding back on the fulling part, because I needed to have one when the rest of the group gathers to do theirs, but my third is close enough to being finished that I figured it was safe to wash the second. Huge and floppy going in… And a nice sized, firm tote in the end. This one had an artistic nature. I worked and worked on it, but that top edge just refused to felt up as tightly as the rest of the bag, and I have no idea why – unless it’s been considering the overloaded appearance of my oft used first bag and thought a wide fill top was in order. 😉 I finally decided to make it a design element and shaped it prettily. It’s different. 😉 I love these bags! It will take a couple days (or with the amount of rain we’ve had lately, a couple weeks) until it’s thoroughly dry, then I’ll shave the areas that need it, clip ends, cut a board for the bottom, and go shopping for lining. Happy me! Although the bag took 3 full cycles, the square took literally a couple of minutes to reach one version of perfection. This is the same yarn I’m using on my current triloom project – Cascade Eco + – and I dearly love the way it came out of the wash. However, I’m going to have to watch it VERY closely when I full it. My square is exquisite for a throw, I think, but it wouldn’t take much more to turn it into a yurt wall. 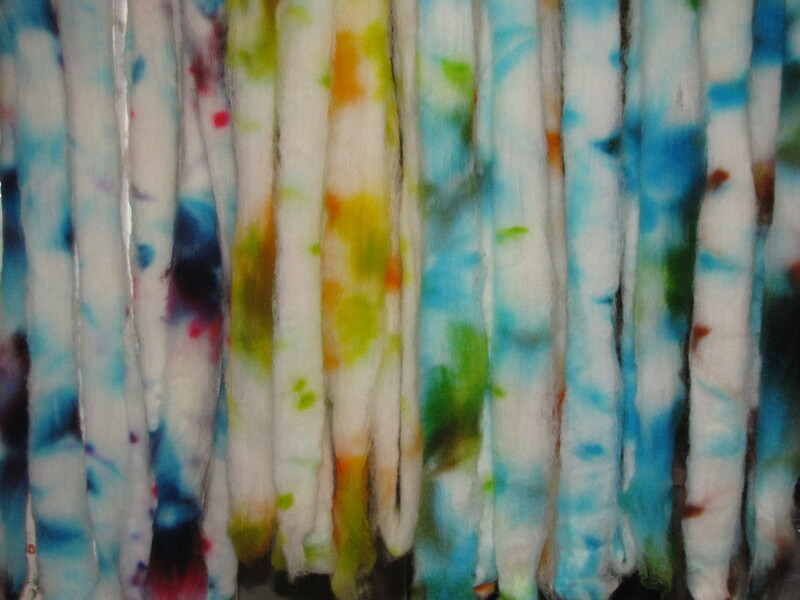 Dyeing kept me very busy on Day 7. 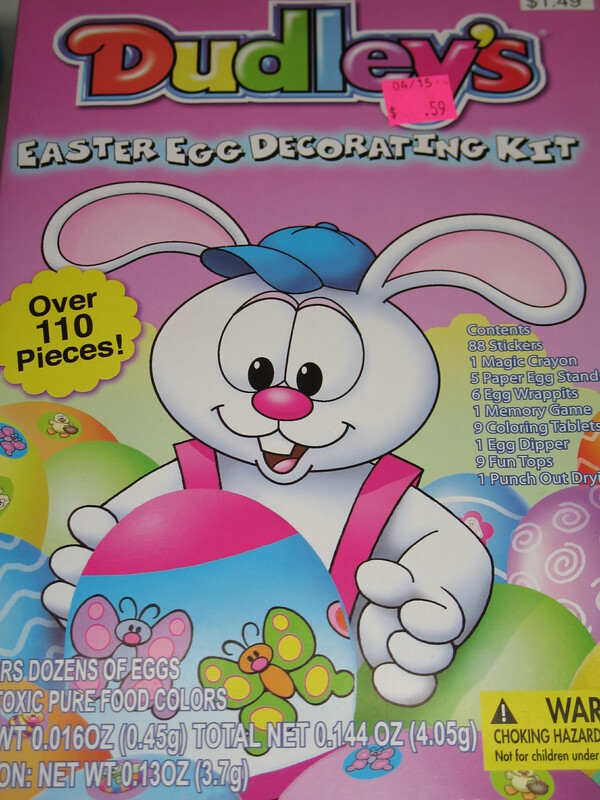 I found a lovely new way to make beautiful colors with Easter Egg dye, but I took step by step photos of the worst possible pot. They just don’t show enough to make it worth posting them, so I’ll just give you the quick details and then show what came out of the pot that has me grinning so broadly. Pick two colors that you think would be interesting together. 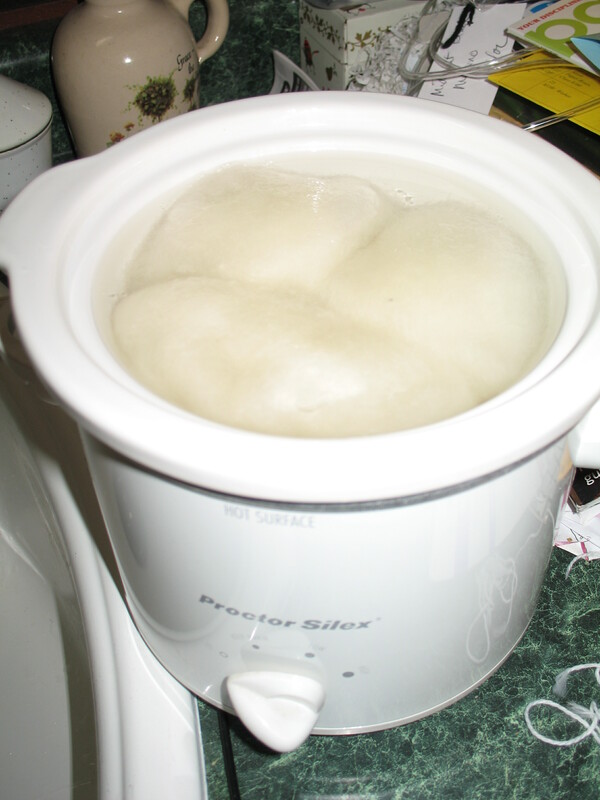 Put 3 ounces vinegar, 4 cups of hot water, and one tablet in the crockpot. Turn it on. 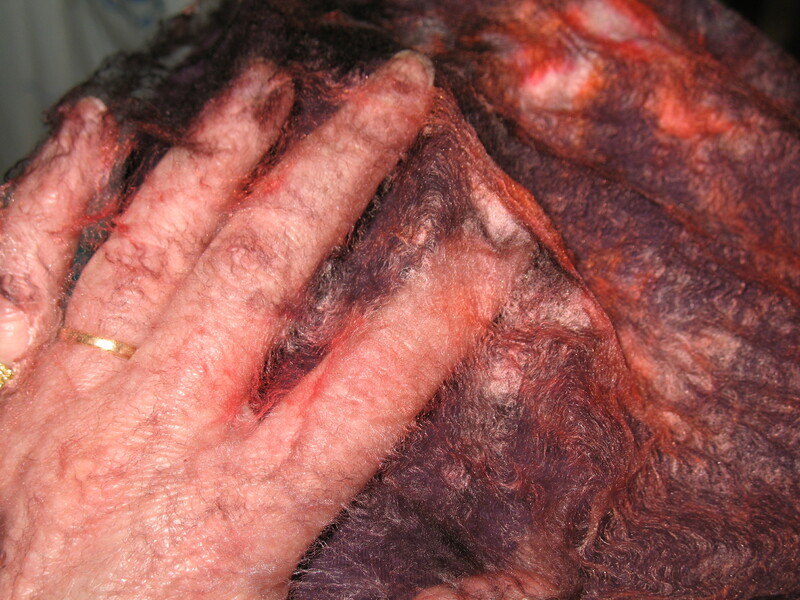 When dye tablet is dissolved, add 1 ounce of wet wool. 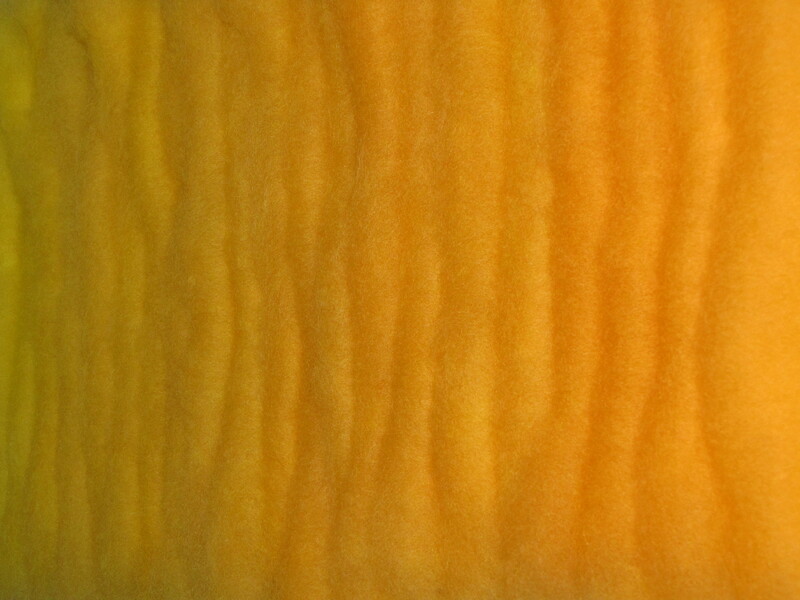 Dissolve the second tablet in a half cup of hot water and soak another ounce of wool. Watch the first pot. 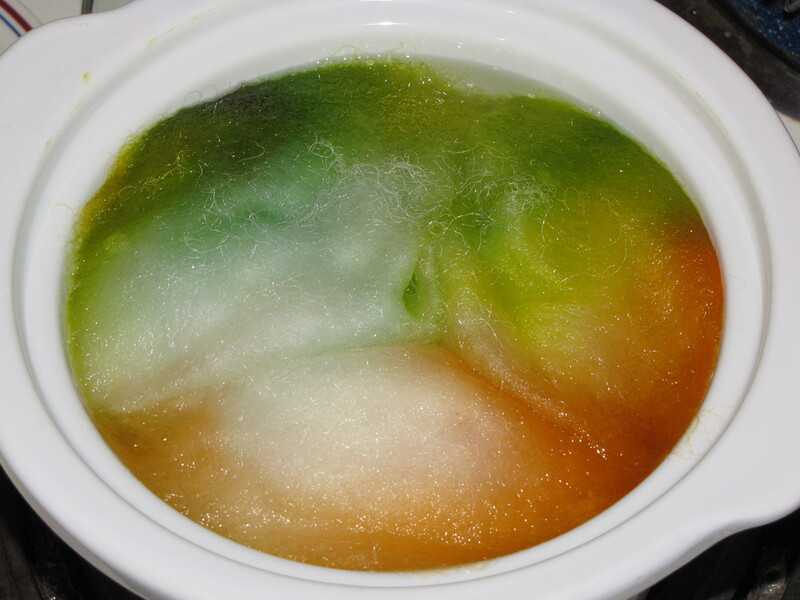 The moment the dye is exhausted – or a couple seconds earlier, randomly add the second color solution. I used a syringe to shoot part of my color in so I knew it was clear through, then I drizzled the rest over the top. This might happen instantly, or it might take a couple of minutes, but watch your pot again. You’ll see the dye starting to strike and the water beginning to clear. Immediately put the second hunk of wool on top of the first and push it down into the water – but don’t stir. There should still be color in the water, but not nearly as strong. 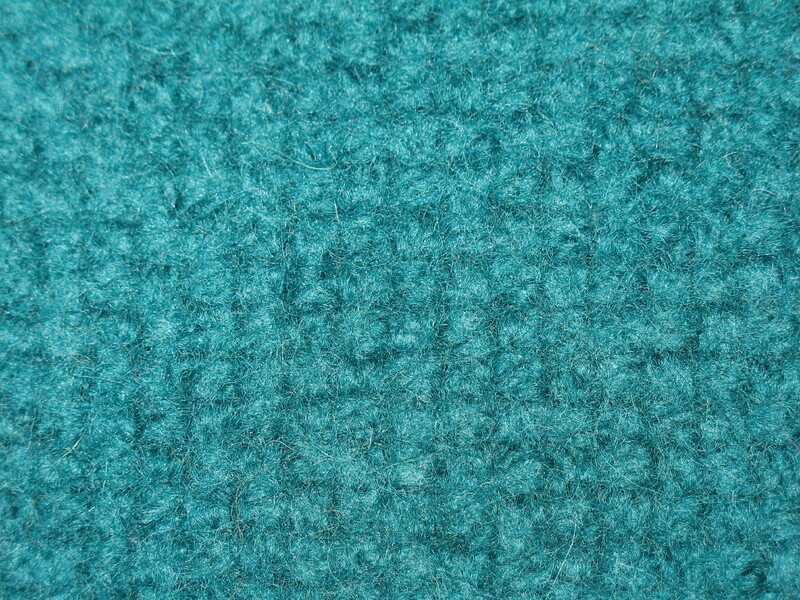 Your top wool will be much lighter than the bottom one, and the color won’t be entirely set in the lower one, so some will drift up into the upper one. 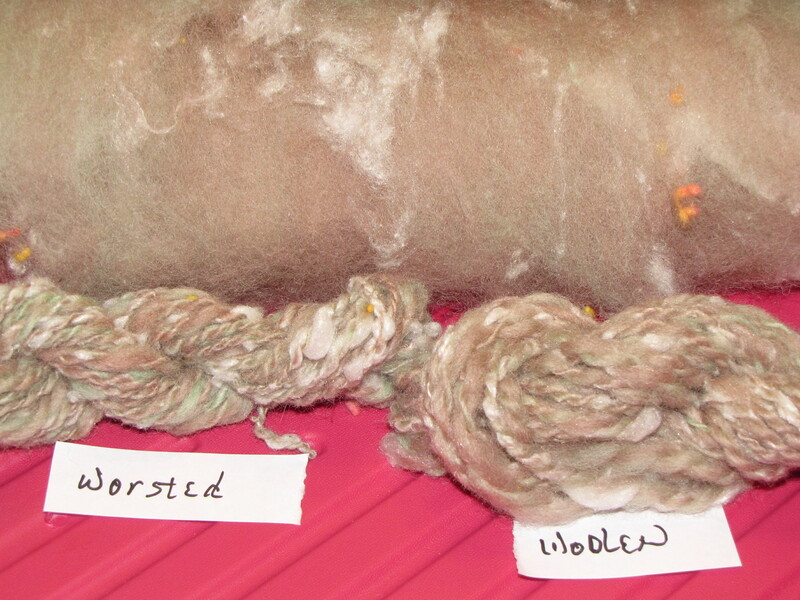 Some of mine benefitted by me flipping the top wool over after about the first 60 seconds. Past that, I didn’t touch it. I didn’t want to spoil the mottled color effect. Simmer for about an hour, cool, rinse, and enjoy your two beautiful creations! And this is just how I did it in my very little crockpot. You know by now that I hope you consider this just a jumping off point. Play! After all, that’s what I’m doing! 😉 First used yellow, then brown second. I almost chickened out of doing this one, but I’m really glad I didn’t! First used hot pink, then used orange. Subtle color shifts, but not so subtle colorway! 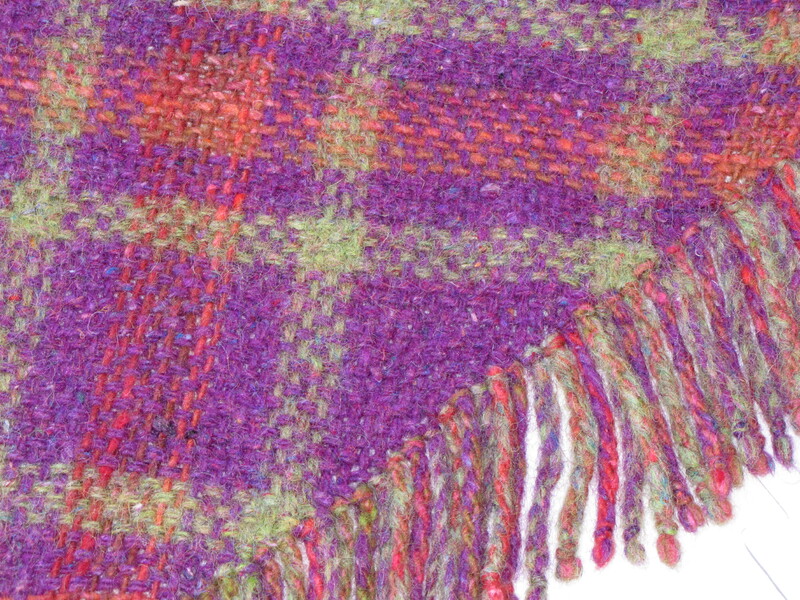 First used strawberry (lighter pink), then purple. See? I finally managed to get a primarily purple dye job out of an Easter egg dye kit! 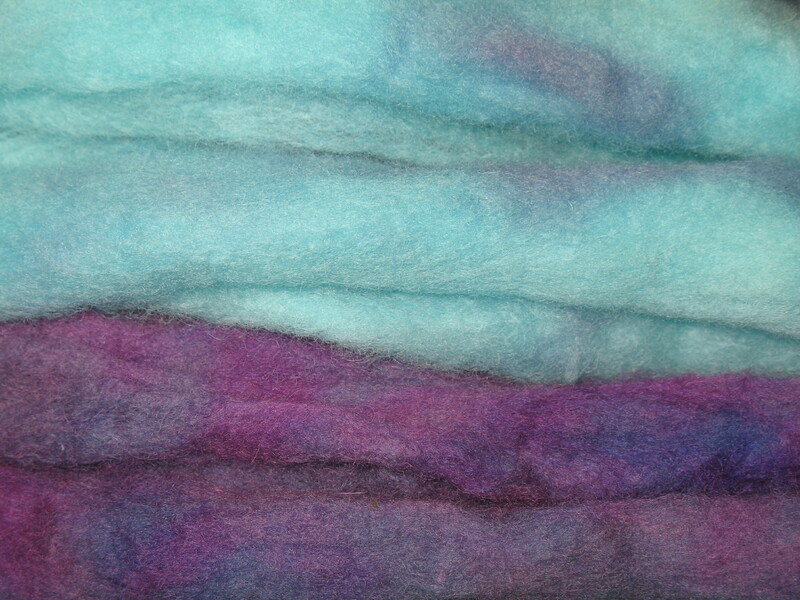 😀 Interestingly enough, the red part of the purple tablet struck at such lightening speeds that absolutely none was left for the top roving, and it came out a gorgeous pastel blue! This was the first one I did, and I didn’t have my technique quite down at that point, so the results might be slightly different if done over – though I doubt it would make a whole lot of difference. 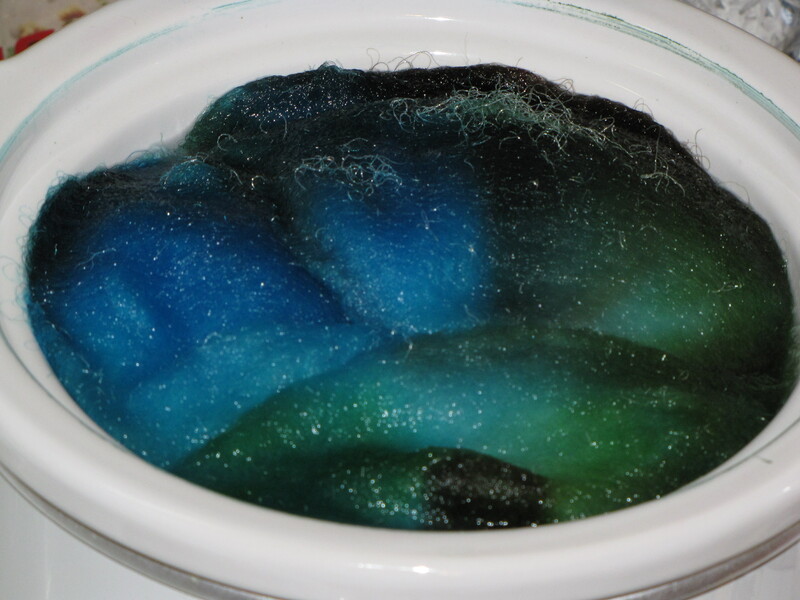 Even with 2 ounces of wool in the pot, there was a little bit of leftover blue dye in the pot. And this is my very favorite! I’d not mind having a LOT of this set. 🙂 Dyed electric blue first, then teal (which, remember, looks more like grass green). See? I actually got something that LOOKS like teal in this bargain! 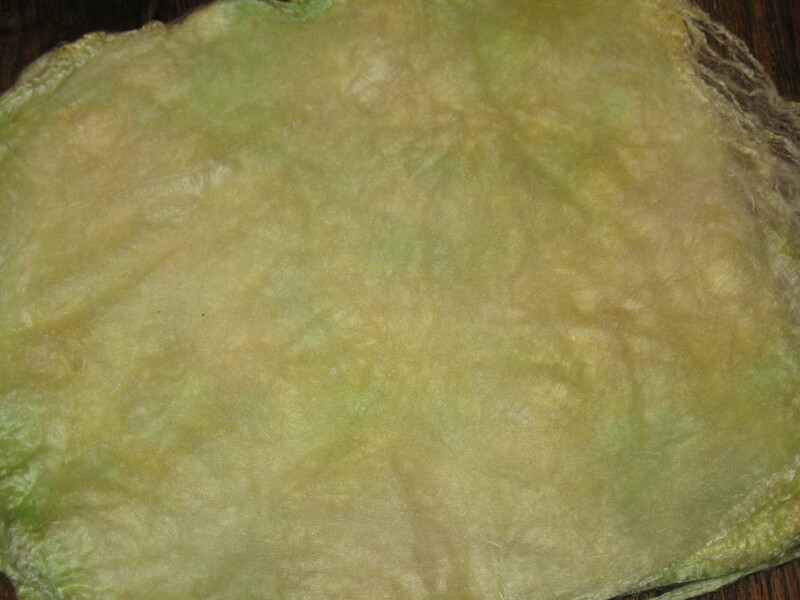 I reserved just a bit of the yellow dye and still had the chartreuse (so called spring green) tablet, and I decided to test drive dyeing some of the mawata I bought Monday. 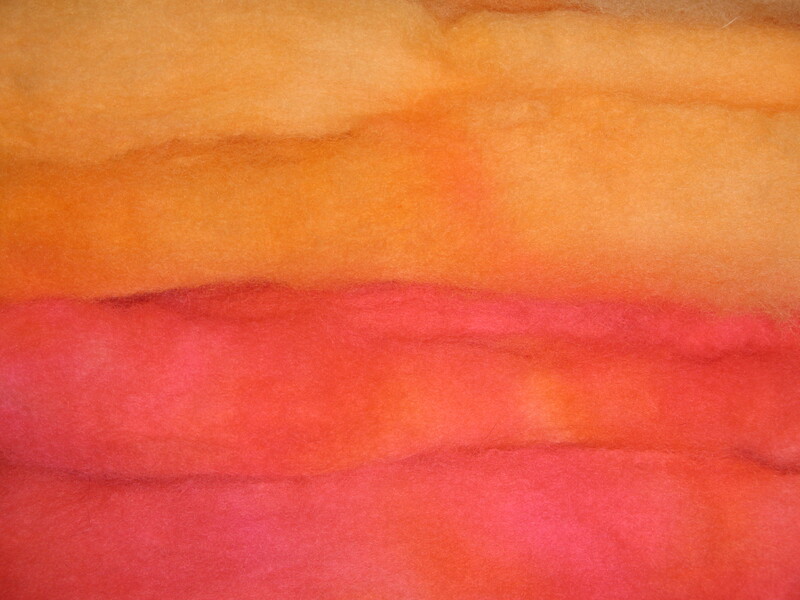 The first big discovery I made is that silk might be a great candidate for Kool-aid dyeing; it stinks when wet!!! 😦 I’m rather surprised at my results, as silk usually dyes brilliantly. I suspect I may have needed more vinegar? 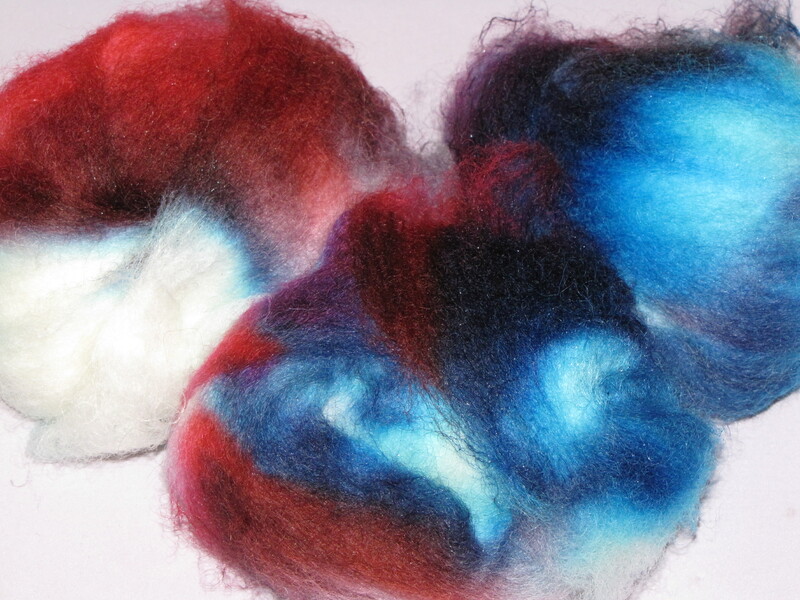 Or there’s a magic trick I have to discover somewhere that needs to be used when dyeing silk. 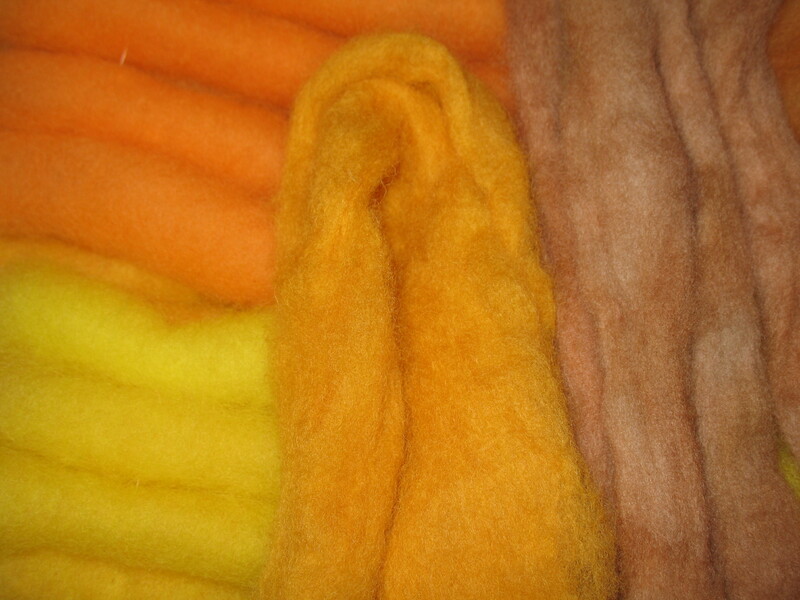 I have lovely silk, but I also washed a lot of dye down the drain rinsing them, and they left enough dye in the pot to turn another ounce of wool this beautiful pastel yellow. While dye pots were simmering, I was doing some other little projects. 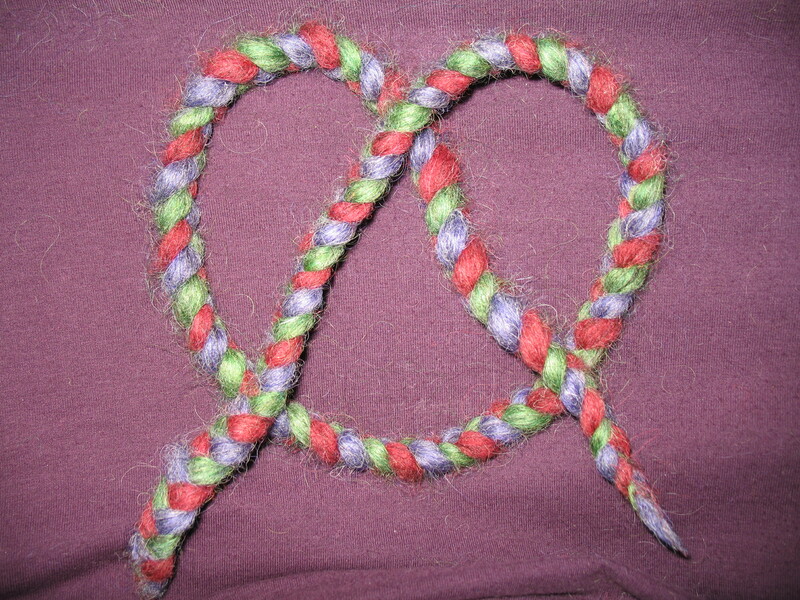 I braided and sewed another mug rug (Yeh, I haven’t sewn the second braid yet, but…), then steamed the 2 that are finished. Nice? 🙂 I did a lot better job on this one, I think. This is a good thing, since ultimately I’d love to make a rug… And after watching Judith MacKenzie spinning from a mawata on the Luxury Fibers DVD, I was curious to try doing it. Definitely an interesting and fun experience, and not so hard as I’d expected, even though I was using my Peruvian spindle instead of my otherwise occupied wheel. It takes a LOT of twist, and the fact that I achieved a reasonably consistent yarn pleased me greatly. Because of the nature of mawata, spinning from them doesn’t create the quintessential sleek silk yarn that comes from reeled silk or even tops. There are built in slubs and inconsistencies, but they make a very pretty, strong, fine yarn with relative ease. 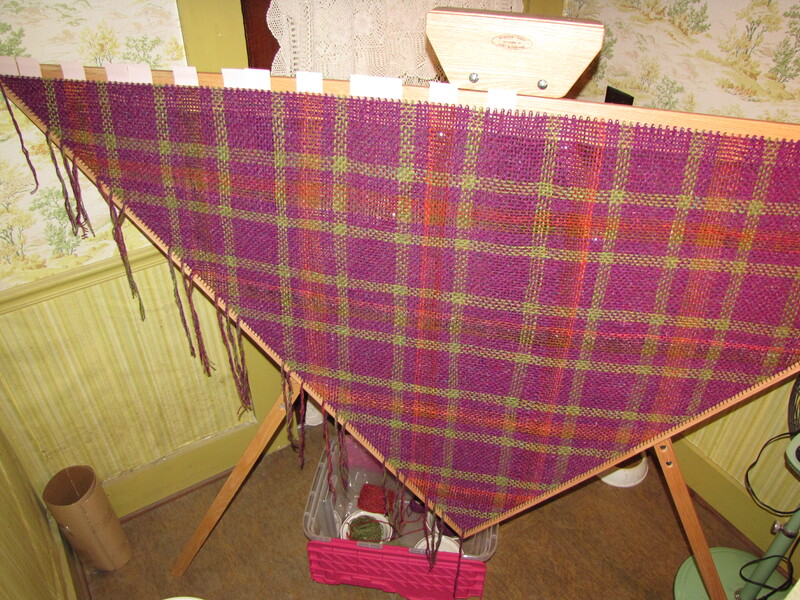 Out of just one layer of silk hankie, I spun 3 yards of 2-ply yarn at approximately 36 wraps per inch. How fascinating it is to compare the appearance of this yarn with the project I’m knitting unspun straight from the hankies. It was a good experiment, and I want to do more of this, but next time I’ll use either my wheel or a little heavier spindle. I wondered if I could finish my first Fiber Optics roving tonight, but it was not to be. I did make good progress, finally reaching the first of the black. I’m still enjoying this project for the most part, but whereas the first half of the roving spun like butter, somewhere around halfway, I began to be plagued by nepps and rough spots. 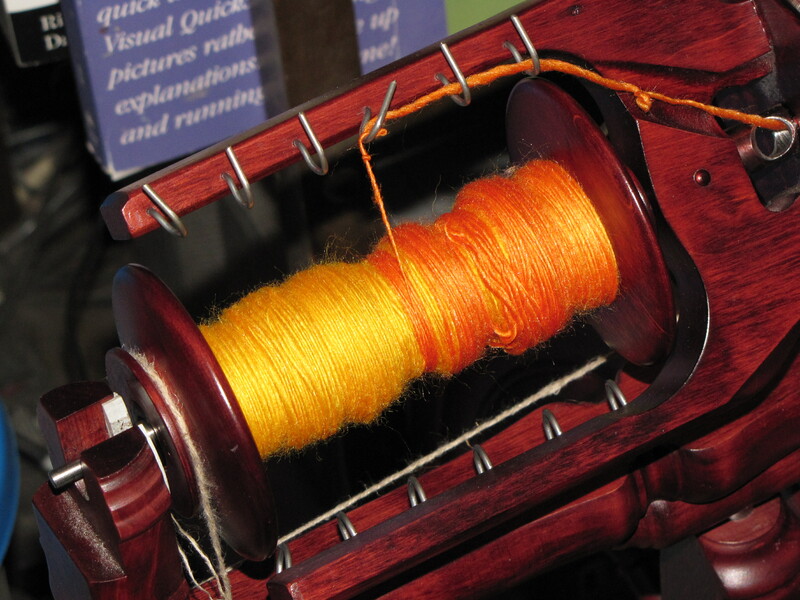 That’s slowed me down a lot, as my goal – and initial success – was a fine worsted spun yarn. 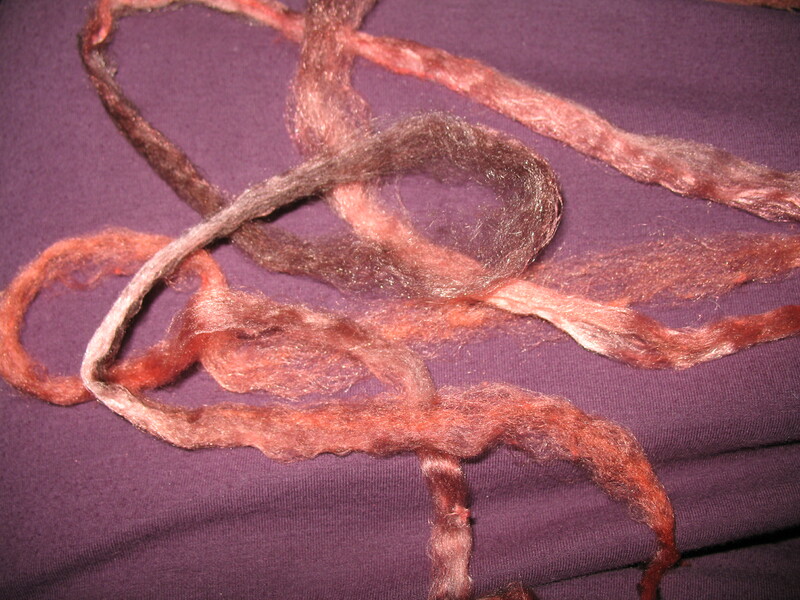 These irregularities are enough to throw off the balance of this still newbie spinner, but I suspect I will still be pleased enough in the end to forget my current irritation with the roving. I guess that’s one benefit of not being good enough to even imagine perfect spinning yet. 😉 I only got to watch the first DVD of tonight’s review set, but WOW! 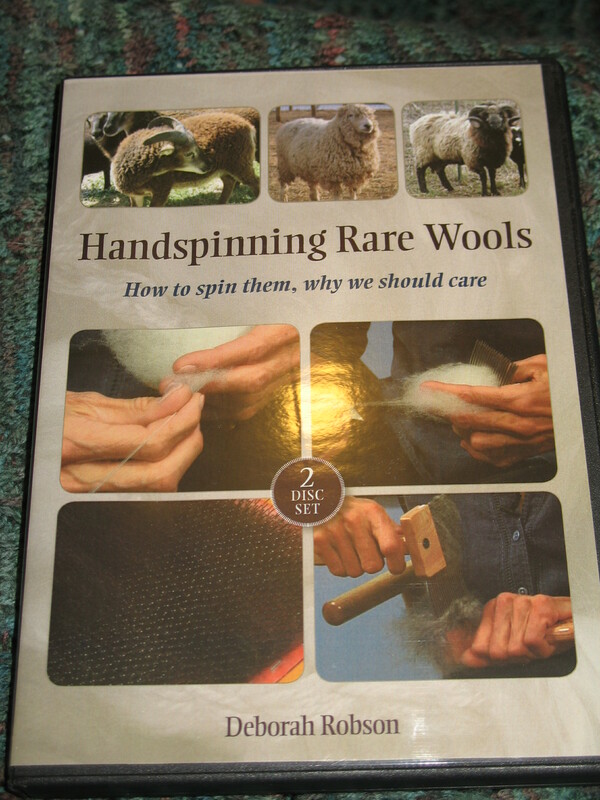 Deborah Robson’s Handspinning Rare Wools; How to spin the, why we should care is destined to be another of my favorites. 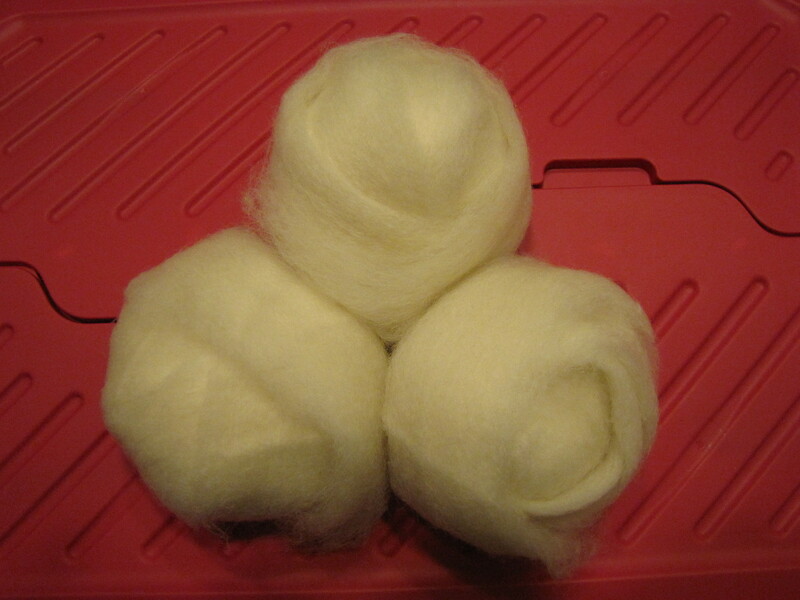 I’ve always been drawn to the unique and unusual rather than automatically being part of the flock, so when I started looking at fleeces, I quickly found myself more drawn to Racka and Black Welsh Mountain than Corriedale and BFL. I also have a collector’s nature, so love to gather variety instead of getting into the rut of having one or two favorites. This DVD set was made for me, I think! I’m really enjoying the breed stories and watching her spin some of the challenges she’s explaining within the fleeces. 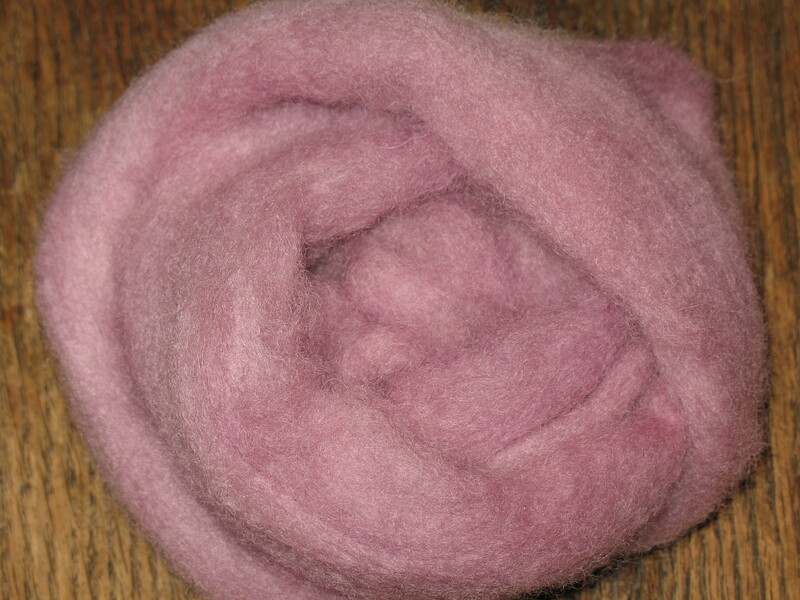 And she’s full of wonderful ideas for using some of the “sturdier” wools – ideas I’d not come up with yet. This is another video set that’s going to get some regular use. I’ve not explored it yet, but there is some sort of printed material on the disks as well. I’m curious to see what it might be. And tonight, one last thing. 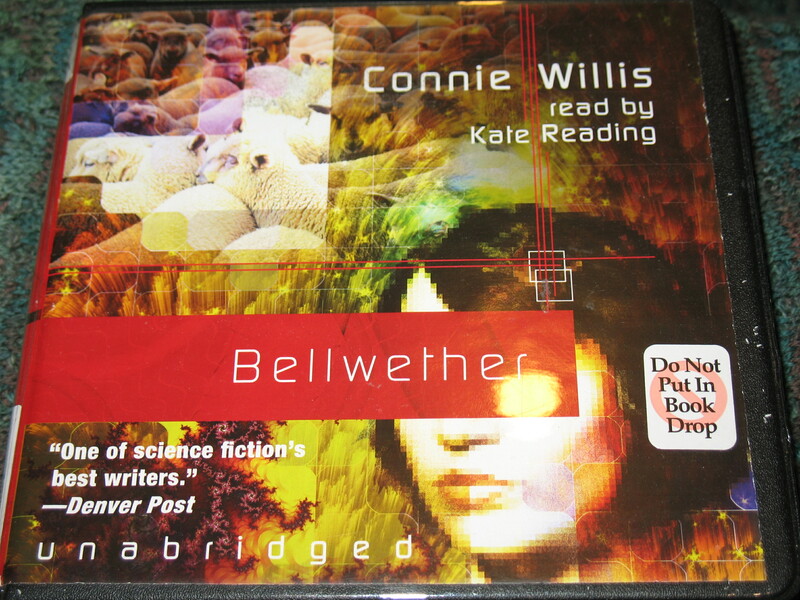 My audiobook this week has very fittingly been Bellwether by Connie Willis. It was very enjoyable – a little predictable, but quite the pleasant read, as it was written with a sense of humor. Personally, I’m rather amused at the science fiction designation on the book. It’s fiction, and the primary setting is a science lab, but that’s as far as the connection goes. If you find yourself looking for a light, enjoyable read with a gentle romance interwoven with a few laughs, in a not so ordinary background fabric, I’d recommend it. Don’t forget – Blog Candy this weekend!!! Oh, did Day 6 of Fiber Adventure Week ever whiz by! It definitely didn’t play out as I’d planned, and now I’m feeling a little frustrated as I look at Day 7 and try to prioritize what’s left on my list. I was on the phone a very long time yesterday, so although my hands stayed very busy, it wasn’t necessarily the way I’d expected them to be employed. 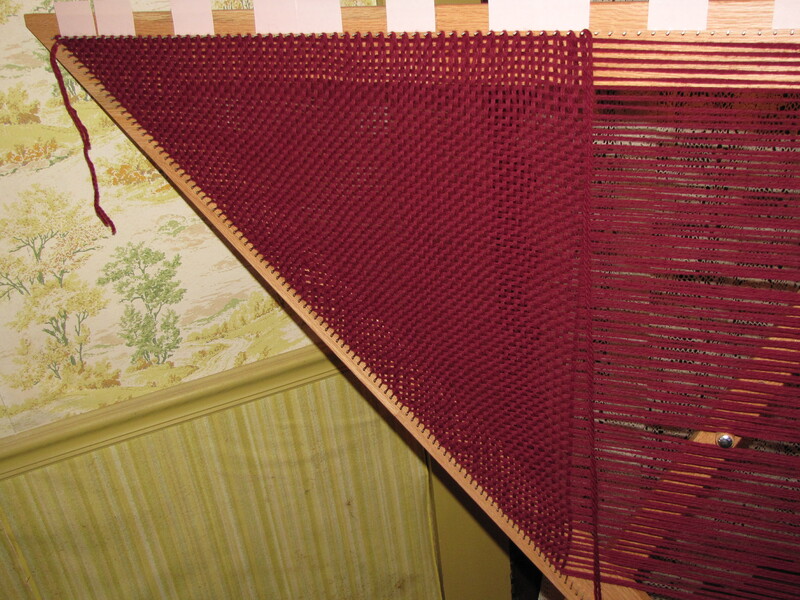 I got a lot of work done on my triloom weaving, which is a perfect occupation while talking. Now that I’ve doubled my tool inventory by adding a hair pick to my crochet hook, I’m finding it much faster and easier to even and beat my weaving. 😀 Along with pretty much everything else, this is NOT going to be a finished project by the end of the week, but I knew that from the start. It’s actually only well begun, but that’s enough. 🙂 The dyeing was sadly lacking today. I couldn’t think through what I wanted to do with my next kit while I was chatting, so the only thing I did was finish up the last two pots from yesterday’s dyeing. The dusty rose was achieved by mixing the last quarter of the brown with the lighter pink, which I believe they are calling strawberry. It’s a nice color, and I’m happy with it. 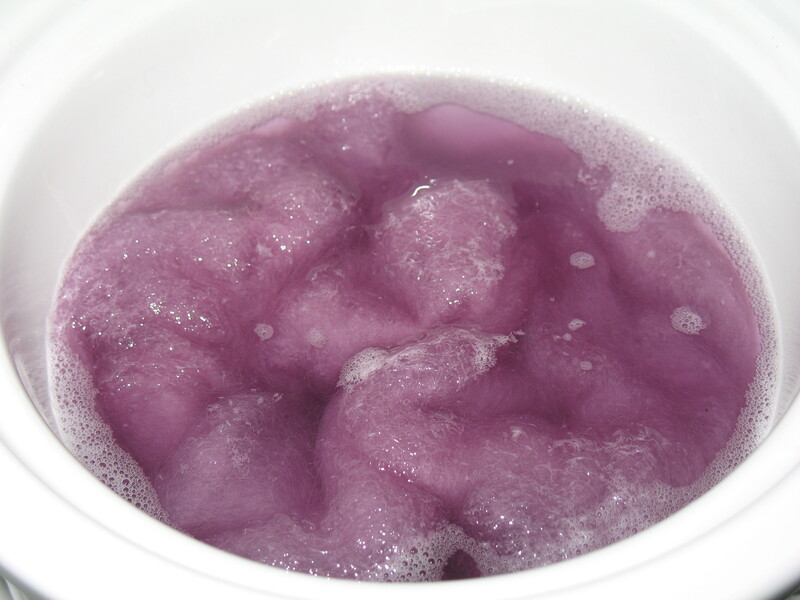 As for the other… I decided to try the purple solo again, this time knowing more of how this obstinate color worked. Well… it’s better than it was the first time, but it is still multi-colored. 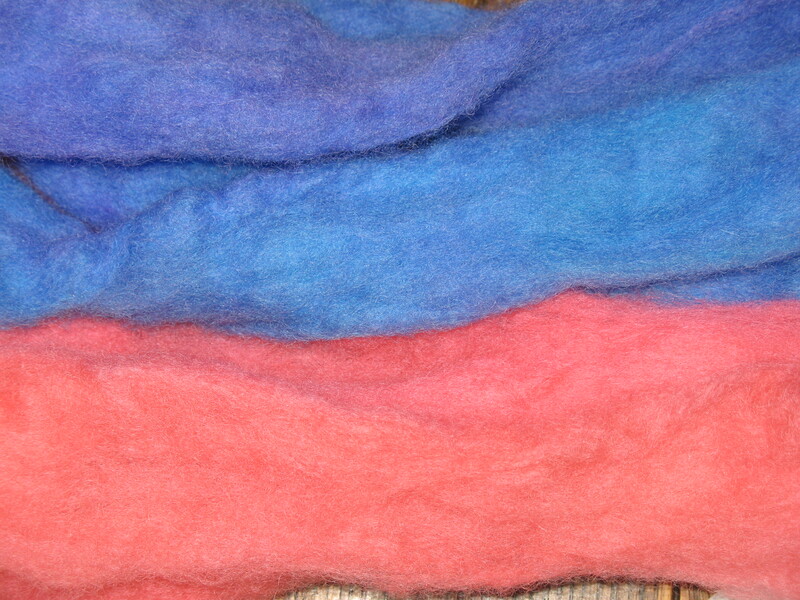 There doesn’t seem to be enough red/pink in the tablet to color the entire roving, so it’s gone quickly. There’s oodles of blue, though, and even the areas that get the pink tones are a lavender blue. Camera has even more issues with the pink tones, so this isn’t an accurate color rendering for the purple. 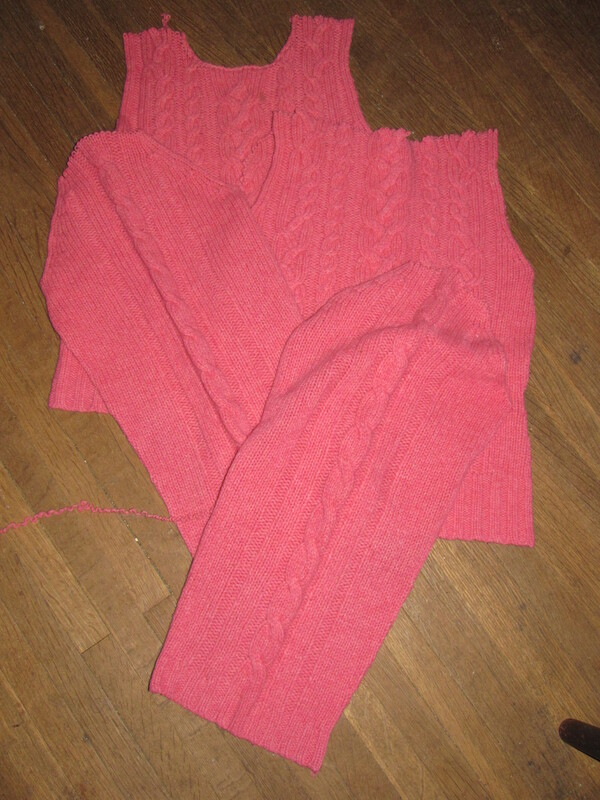 Another good phone time project was deconstructing the other of the sweater twins. 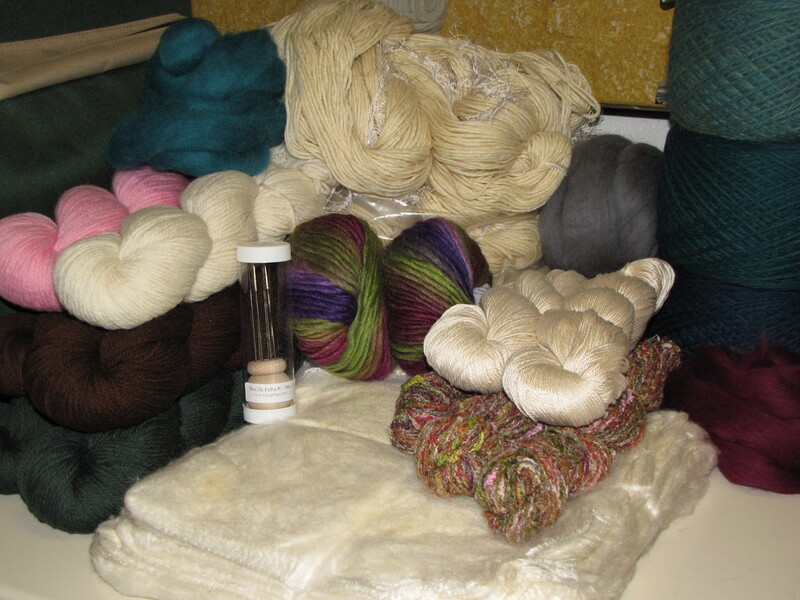 I now have a total of 22.5 ounces of 50/50 Shetland/merino wool to play with. 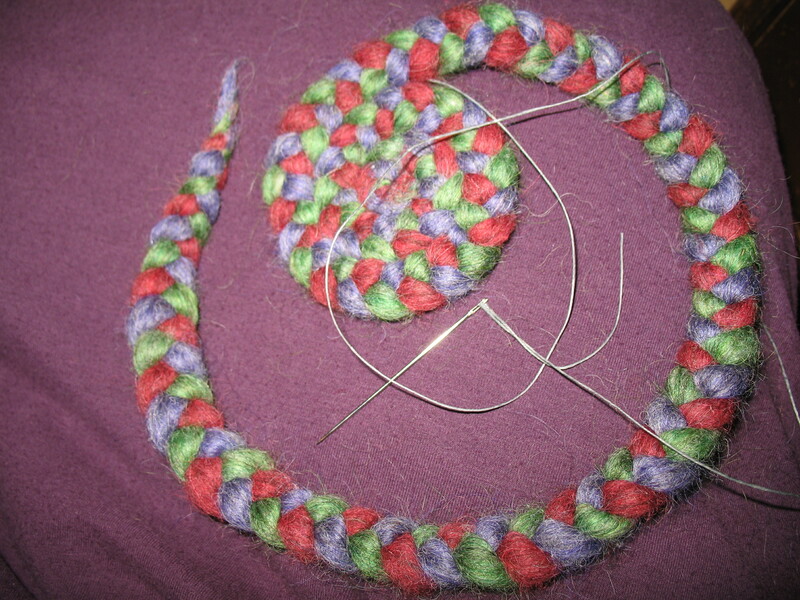 I did some finger twisting to see what this would look like if I did some spinning. It’s 3 strands of fine 2-ply as it is, and I spun that into both a two and a 3-ply – the 3-ply technically being 18-ply, I guess! It’s a mighty enticing bit of yarn done that way, and I’m thinking I may cave in. 😉 I’ve been collecting an assortment of small looms, but other than doing a couple of little squares on a Weave-it style loom, I’d not done anything with them yet. Tonight I decided to try out the 12″ square as a bit of a fact finding mission to see precisely what I can do with it and decide what I WANT to do with it. This lovely loom was made by BigFam15 on Etsy, who has satisfied my idea saturated brain by producing looms on special order in the exact sizes I wanted. I’m also impressed with the value and the great service. 🙂 I was weaving each row for a while, then I realized I could simplify things for myself by creating one of the sheds permanently. 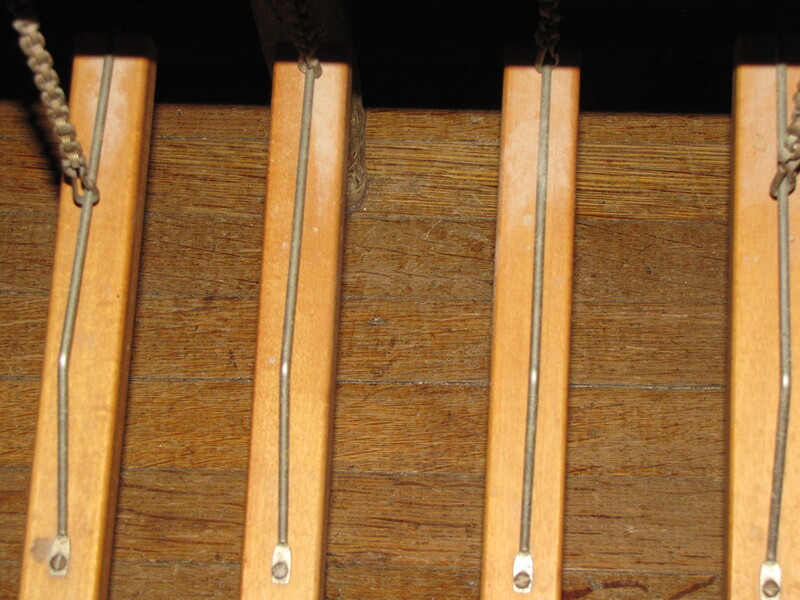 I moved the yarn on every other nail down, and the remaining ones to the tops of the nails. Voilà! Now I only have to pick every other row! 😀 That really sped up the work! 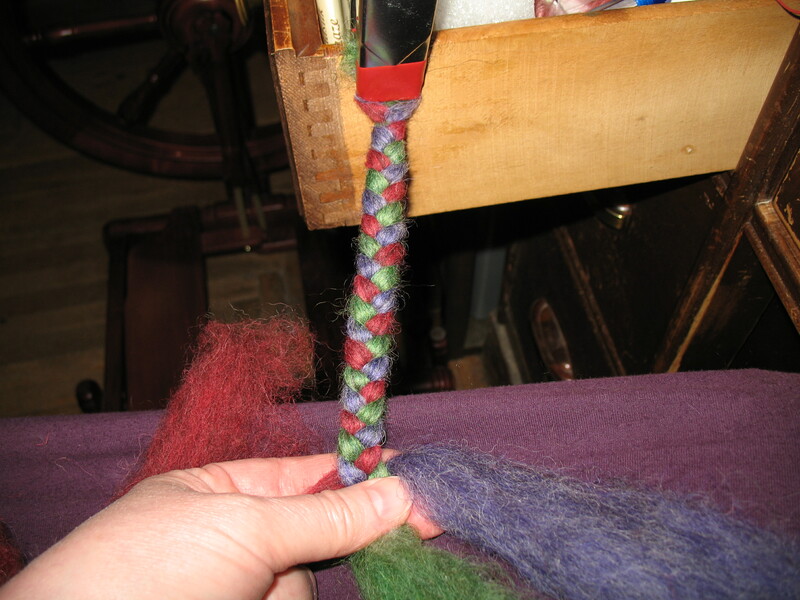 I wove this by pulling a loop through the shed to the nail on the opposite side, so it was effectively weaving double stranded, though easier to keep smooth. 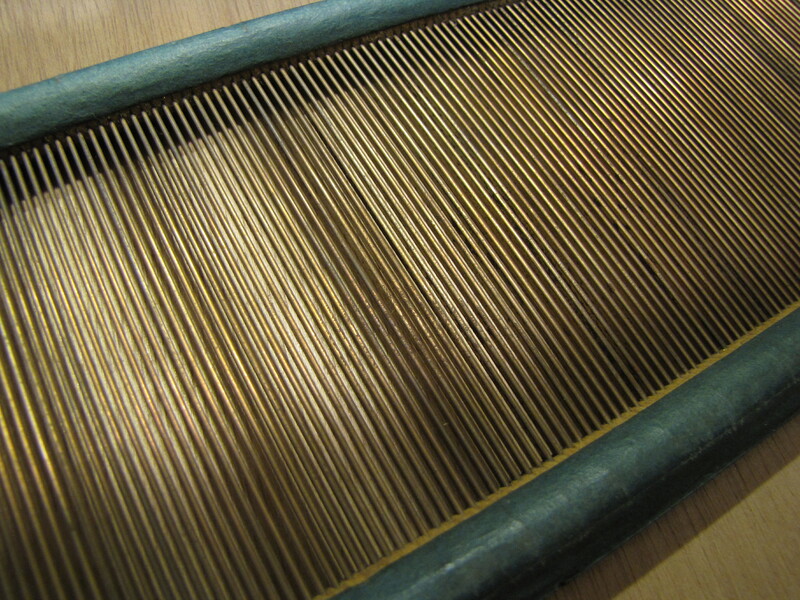 It also saved a lot of wear and tear on my weft and eliminated the need to add new pieces as I worked. 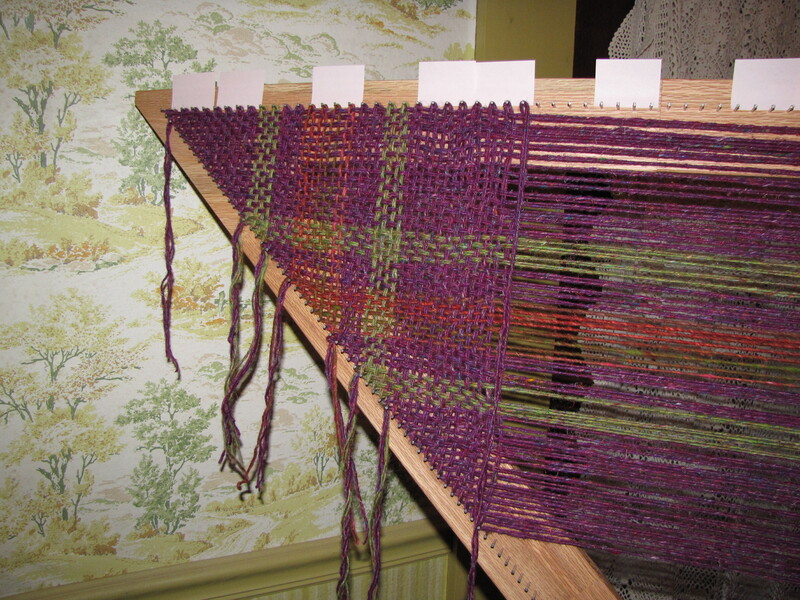 Ultimately, I didn’t cut off the yarn until I was done, warp through finished project. 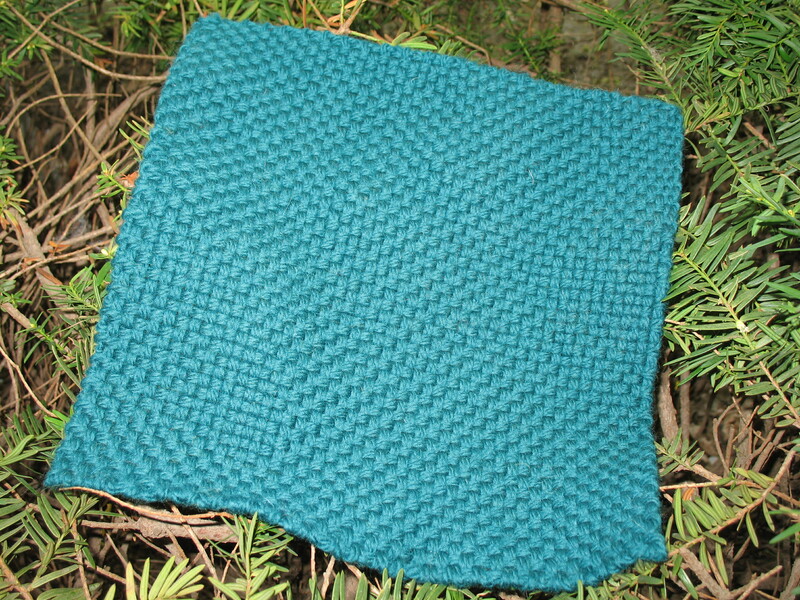 The resulting square, woven with Cascade Eco + is smooshy and soft, and it has a nice drape. In short, it’s just perfect. 🙂 Since the yarn has a lot of bounce to it, the square came off the loom at 11″. It would be a lovely texture for an afghan just as it is. 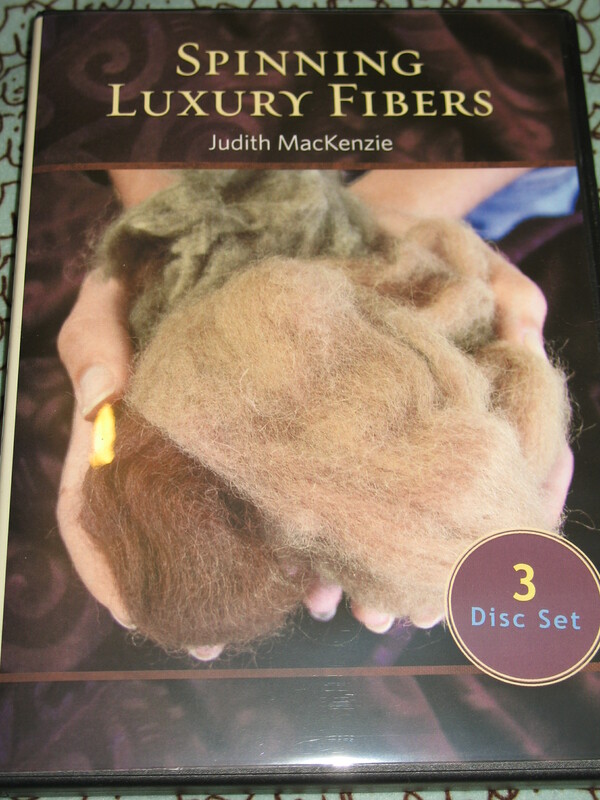 I did play around with the square for a while after I finished it last night, but I didn’t accomplish anything remotely satisfying, so it’s back to “just as finished.” It seems that I saved my favorite Judith MacKenzie DVD set for last. 🙂 Tonight I watched the 3 disk set Spinning Luxury Fibers, and my head is what is actually spinning! This set has enough material to keep me in learning mode for years, I think, and it contains a lot of bits and pieces of things covered in the other sets, too. If I was allowed to keep only one of the 4 of hers that I watched this week, this would be the one. It’s the one which will stretch me the farthest and serve me the longest, and it had the most information that I didn’t know. 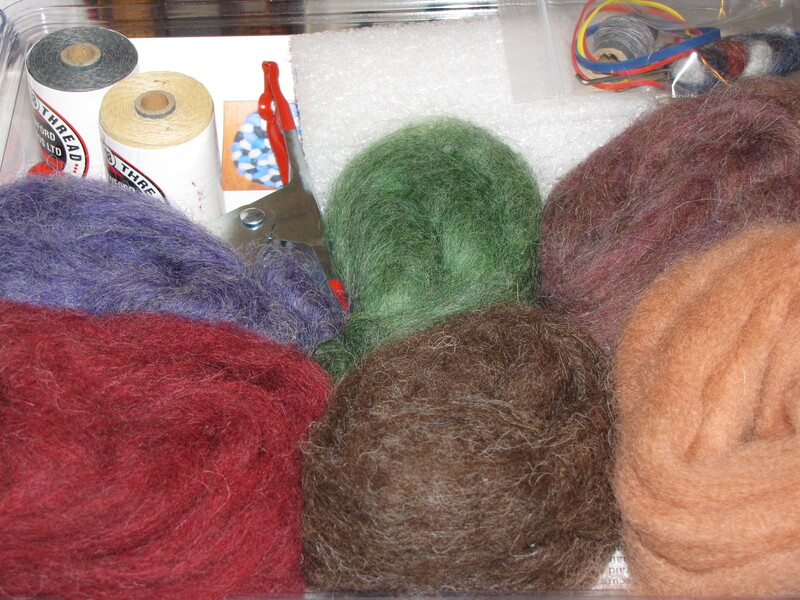 She covers numerous ways to play with silk, using the entire first disk for that topic (hmmm… I could have an all silk FAW someday…), then goes on to camelids in the second and down fibers (qiviut, cashmere, bison, etc.) in the third. Now, whereas this is the “one” I’d keep, it’s definitely not the “one” for a newbie spinner to buy. This is the one to add to your collection once you can comfortably spin wool and are ready and eager to explore more territory. Don’t forget… Blog candy coming this weekend! Day 5 started out with what has been my least favorite activity of the week, though it was quite needed. 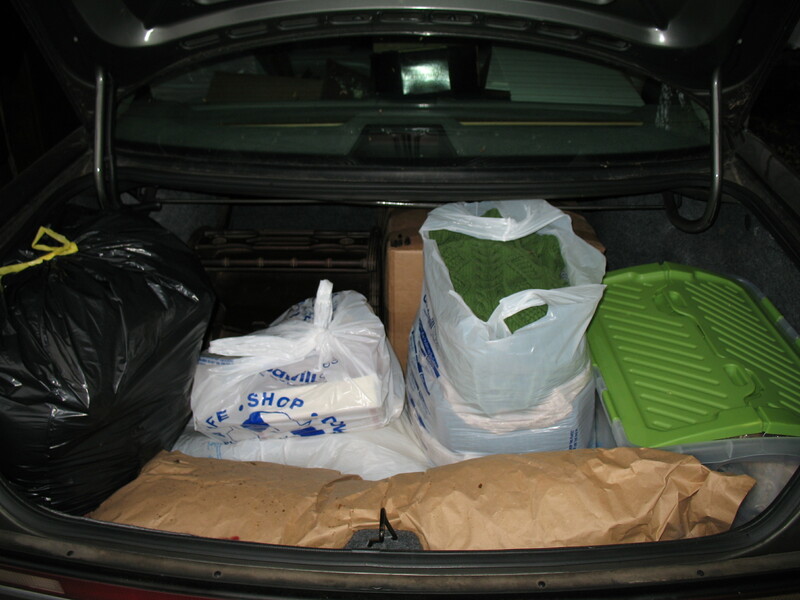 My trunk has become a bit of a storage unit, primarily for fleece, and I couldn’t find a thing. In fact, I wasn’t even sure what was out there in the jumble, and I needed to do an inventory as I start into working on my MSP (Master Spinner Program) certification. It looks a lot better now, I have a written inventory, and I even found a few treasures I’d forgotten about. 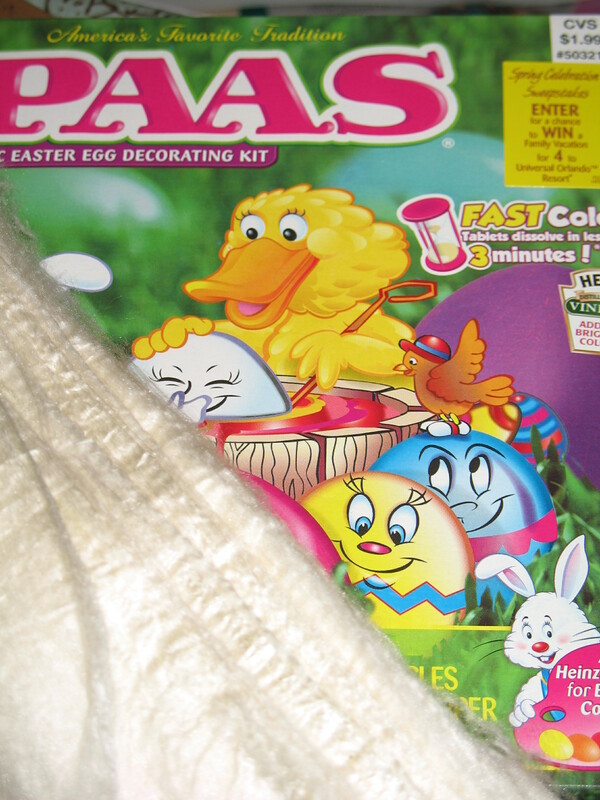 🙂 The day I raided the Easter egg dyes at the Goodwill, I’d also gone yarn shopping – in the sweater department, of course. 😉 The big white sack in the photo is full of some really great yarn, and it cost me next to nothing. While I was folding them (The guy at the check out had stuffed them unceremoniously into 2 large sacks.) 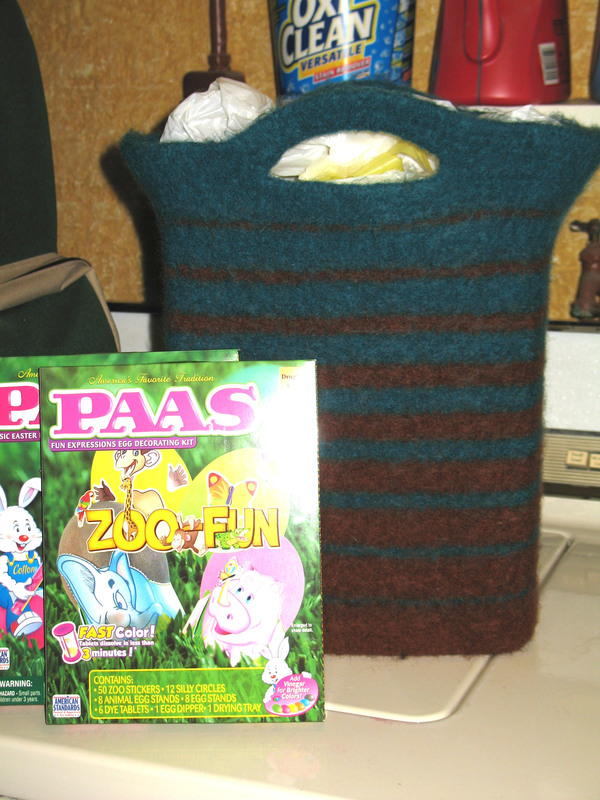 so they would fit into one bag, I was drawn to the amazing twin sweaters I’d discovered. They’d both been worn. One was a medium and the other a large, and they were near each other on the rack, though not side by side. This is the first time I’ve ever found litter mates, and that was exciting! Obviously, it takes ridiculously little to excite me. 😉 I checked the seams and found they were chain stitched rather than serged, so that meant they would deconstruct just fine, and the best part was that they were a lovely shade of 50% merino and 50% Shetland wool – and less than $5 total. Any wonder why they came home with me? 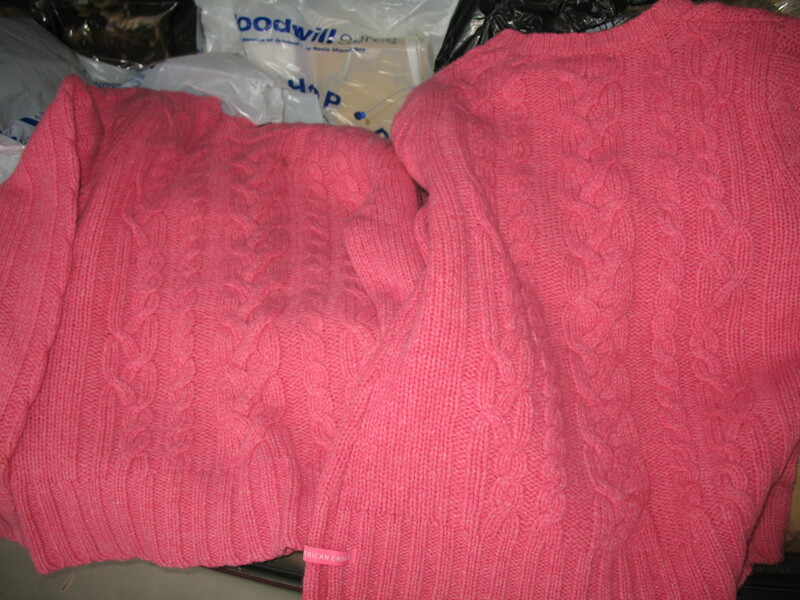 I have a stash of sweaters to ravel, but I’ve not done any for ages, so I decided pulling apart twins would suit for a FAW. In less than an hour, I had the first one apart. These are exceptionally nice for pulling apart, as even the raglan sleeves are shaped with knitted decreases clear to the top instead of being cut and serged. 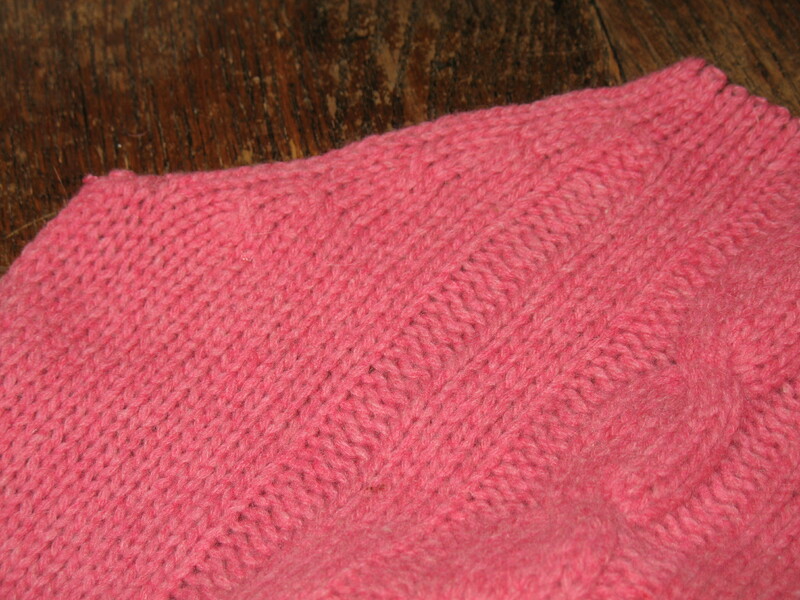 I had well under 10 yards of “waste” yarn from short bits at the very tops of the shoulders, and that was it. I wrapped the longest of these on a nifty cardboard tube I spotted in the bathroom trash, so I’ll have them for seaming if needed later. 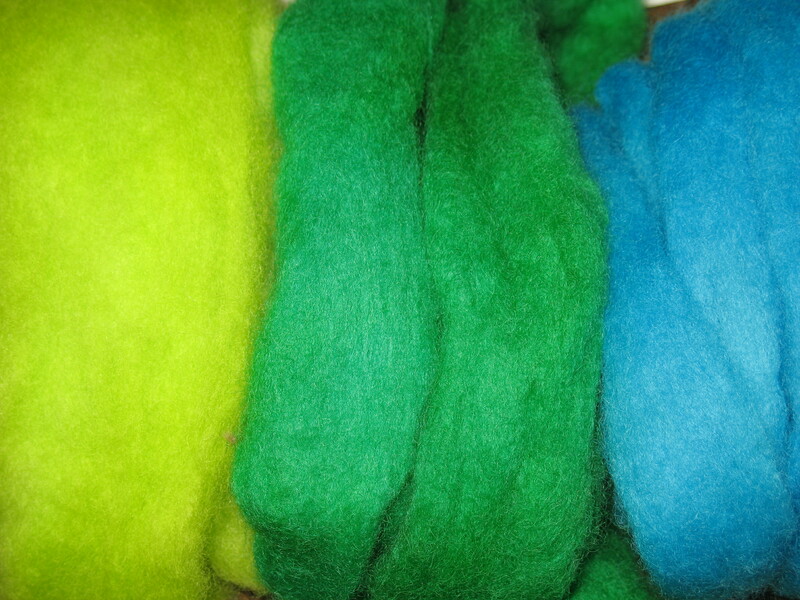 So, I have this ever growing pile of Easter egg dyed roving, and I want to use it somehow, but the bright colors mean I’m going to have to put some thought behind how to use them in a way that will make me love them long term. Tonight, I tried out one of my ideas, and I ended up with something else that made me a very happy person. 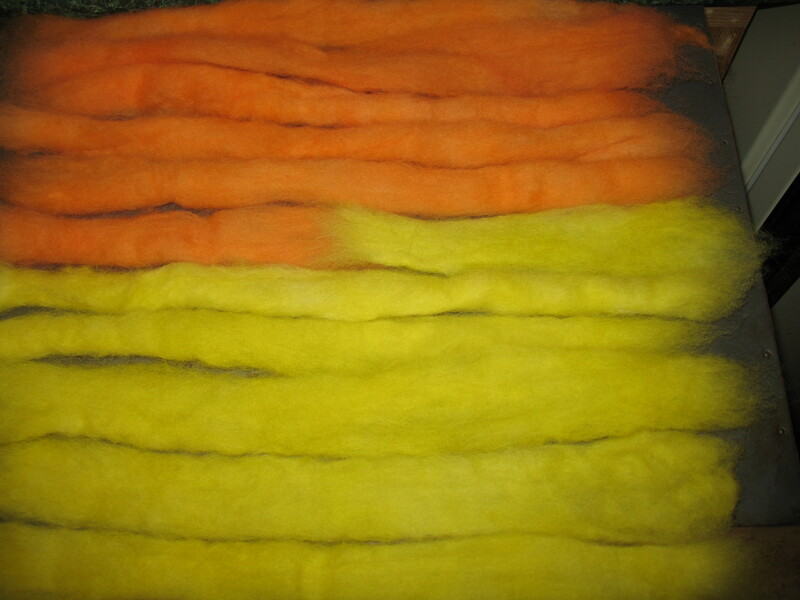 This was my brilliant, sunshine yellow and the sherbet orange solids I dyed a couple of days ago. If you’d like to try making this gradient spinning project, here’s how I did it. 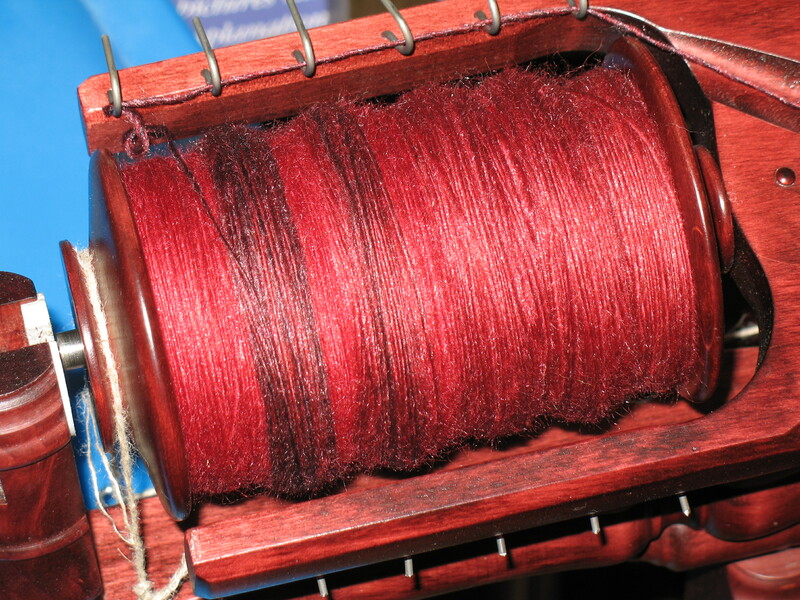 Even with all this, I still found time to spin, and I’m well into the dark red now. 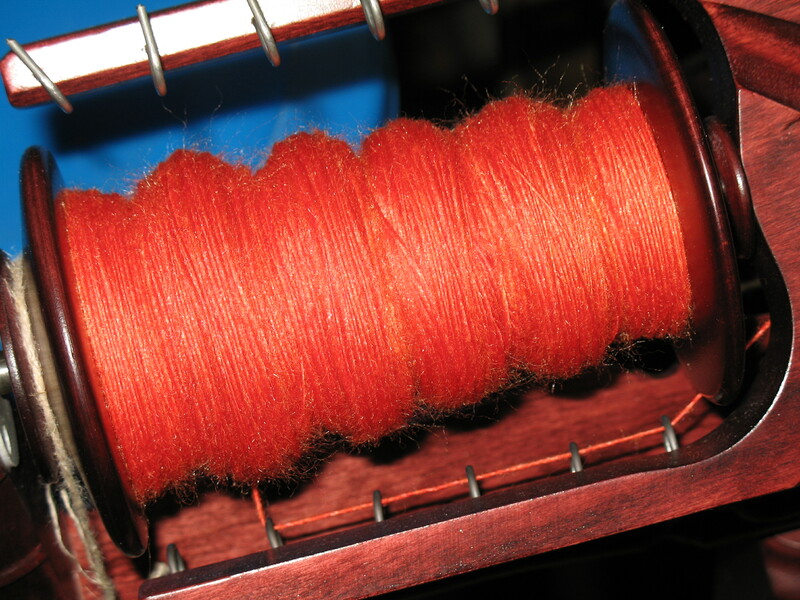 My bobbin is pretty smooshy, and I’m getting very concerned I won’t be able to get all four ounces onto one. I really don’t want to break this single, and I’m a new enough spinner that I don’t really have a lot of good storage options for larger spinning projects. 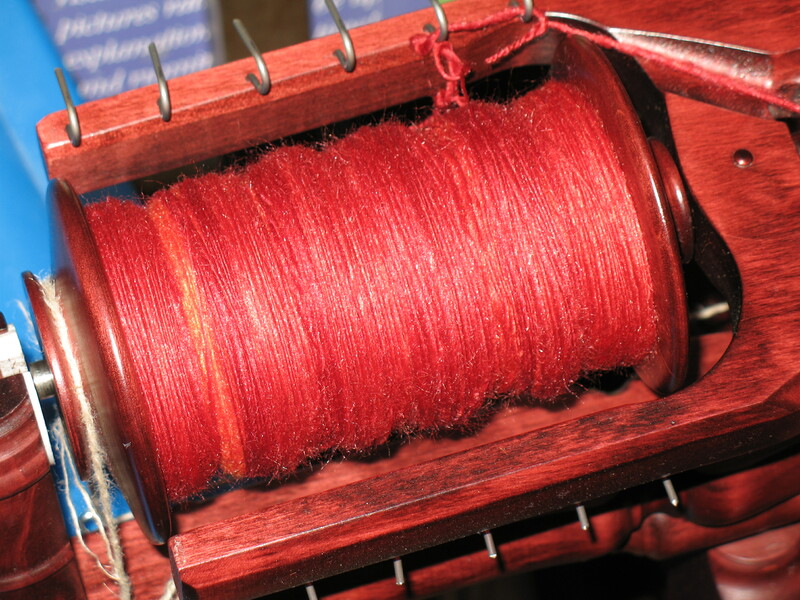 Doing 12 ounces for one spin when it has to all become singles before it’s plied is really pushing my resources if I don’t put all 4 ounces on a bobbin. :S I didn’t do much on the other ongoing projects – one pass on the triloom, and one hankie into the mawata project – so no pix for those. 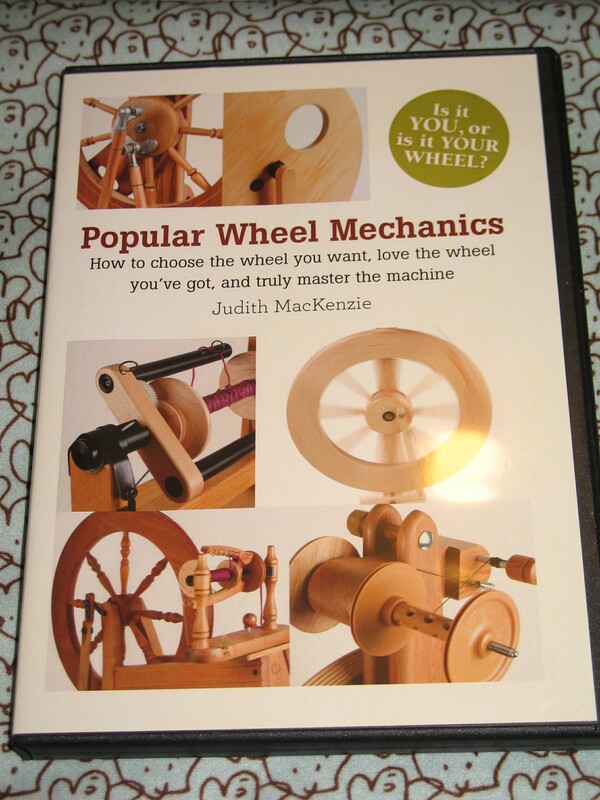 However, I did watch another Judith MacKenzie DVD set – Popular Wheel Mechanics. As I’m coming to expect from her, I found there was much to learn on this set, but I did find myself a little bit annoyed, too. It’s just my opinion, but I don’t think this set should be as expensive as the others. It was sponsored by several of the major spinning wheel manufacturers, and there were more than a few times that it felt more like a commercial than a class. Perhaps that was even more annoying to me since I own Kromskis, and they apparently didn’t buy into the program. The infomercial feel got in the way of the enchantment I’ve felt while watching her other DVDs this week. 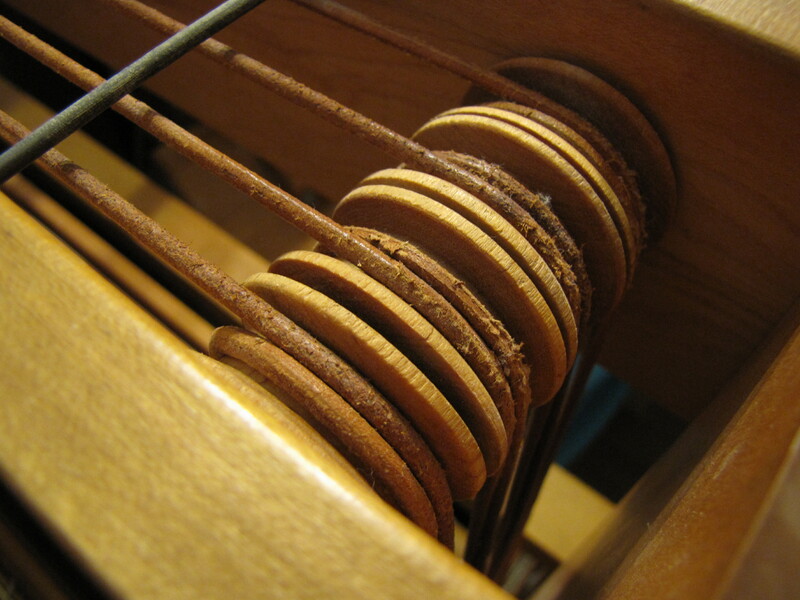 Yes, I did find it very fascinating to see how even small adjustments on a wheel can dramatically change the yarn one can spin on it, but I found it tiring to hear repeatedly about what a wonderful thing Ashford or Louet or whoever had done when they did this or that to the wheels they manufacture, or to hear that “on a Lendrum…” I’d have been a much happier student if the advice hadn’t so often felt “breed specific” and had been stated in more generic fashion. Too much of the presentation felt like it didn’t relate to me, even when it actually did if I turned on the mental filters to remove brand names. 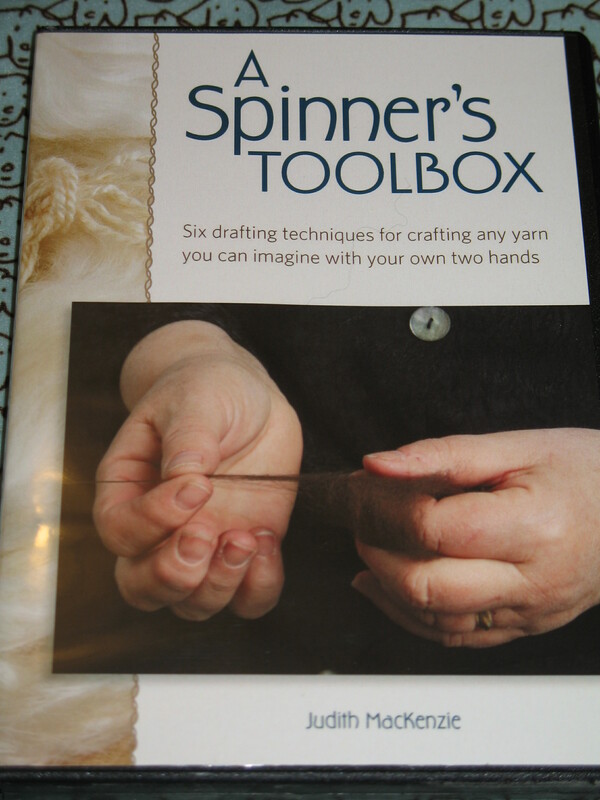 I hope Interweave isn’t going to make it a habit to do this in their DVDs. Secondly, I’ve received some comments that people can’t find how to post comments on my blog. It’s easy – once you know the trick! 😉 If you are on the main blog page, scroll to the bottom of the post and look at the small print. You should see either “Comments” or “Leave a Comment.” Click on that, and you are set. The other way is to just click on the title of a post. That brings up a page that shows only that day’s post, and at the bottom of it, there will be a comment box. 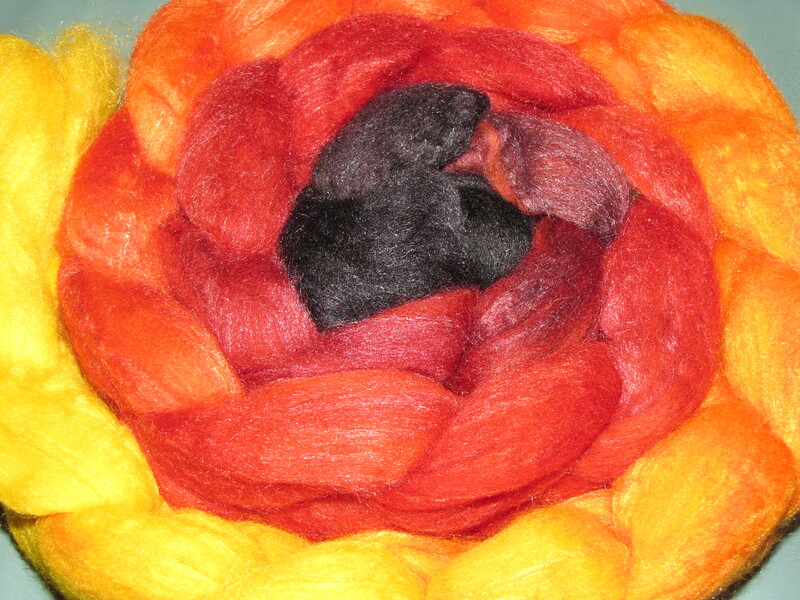 The only one of my major continuing projects I worked on is the spinning. I’m now firmly entrenched in the red. 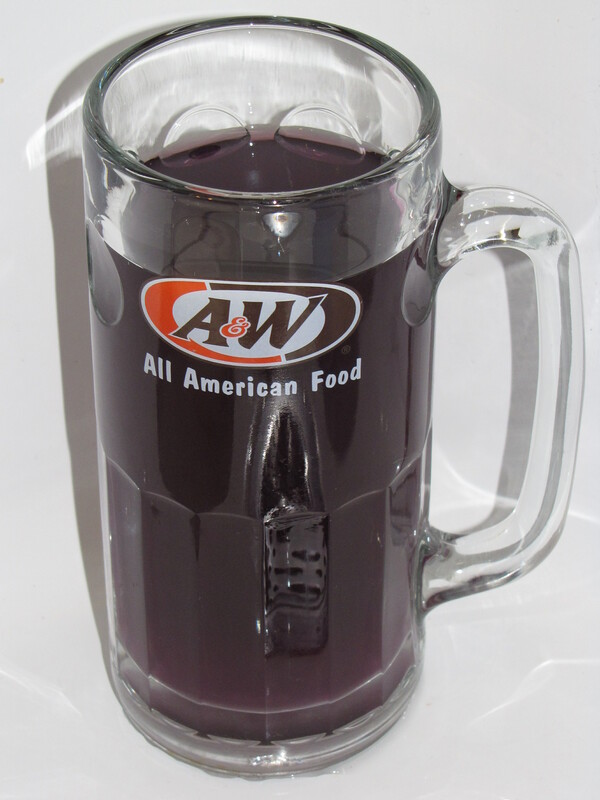 The color makes me think of the flavor of my favorite cherry juice, if that makes sense. Is it possible to taste a color? 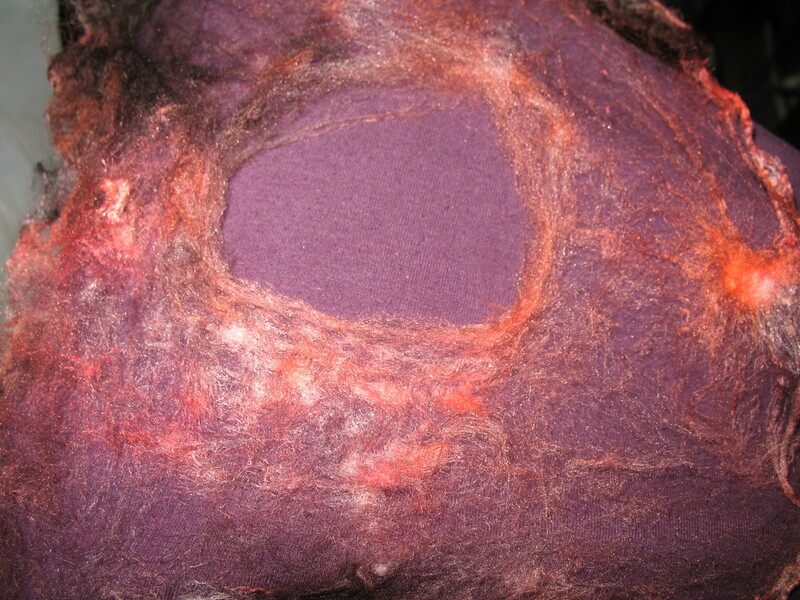 Oh, and look how far I got on my Angela’s Fabulous Felted Bag! I was knitting like crazy during the guild meeting, and I think I put 4 stripes on it. Just imagine where I’d be if I’d not been late due to… ummm… checking out at the LYS… Ignore the colors. 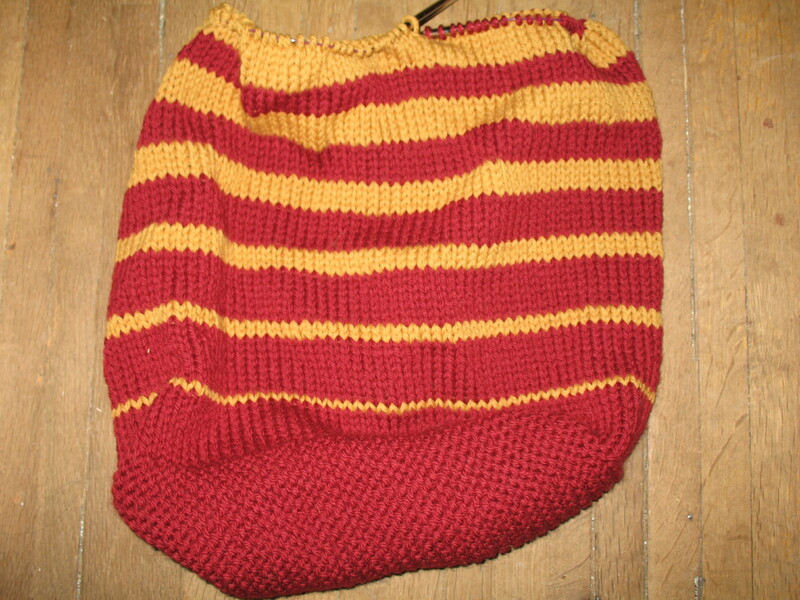 The real burgundy and mustard are a lot prettier and much more “me,” though I must say that the red and yellow I’m seeing on my screen would make an attention grabbing tote! Today’s real adventure arrived in the morning’s mail with decidedly good timing. 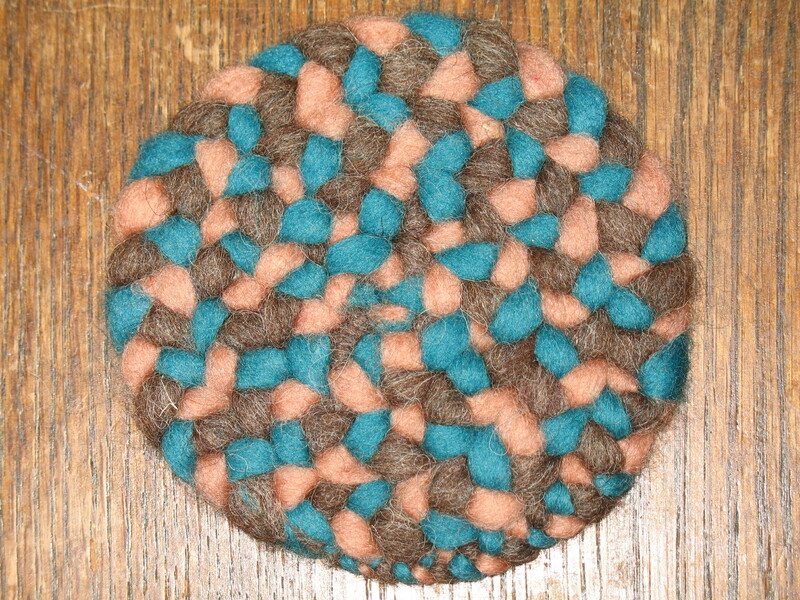 Ever since I was a kid, I’ve wanted to make a braided wool rug, but it’s just never happened. Last week I made a serendipitous discovery on Etsy. ShepherdsRug has an intriguing spin on the braided rugs that grabbed my heart instantly. Instead of braided fabric strips, they use wool roving, making gorgeous rugs without the tedium of cutting and turning in edges, and decreasing the number of tools necessary for the project. 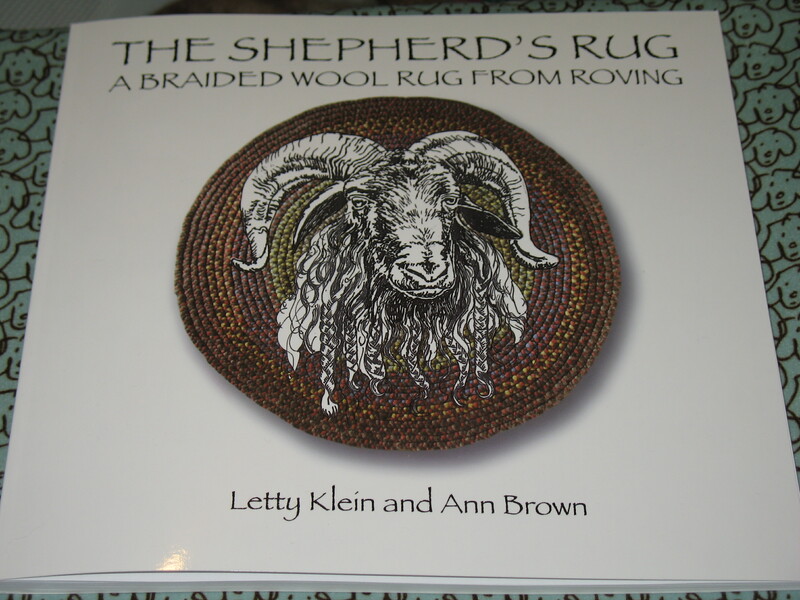 They sell gorgeous finished rugs, but they also have published a great book full of instructions and inspiration, along with some great background info on wool in general (great reference source for my MSP reports!) 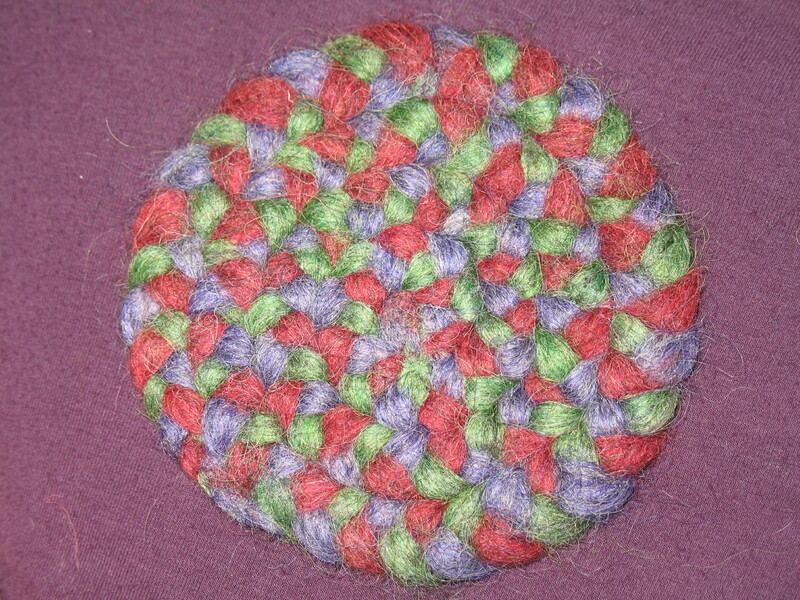 and information about working with the wool from various breeds when making braided rugs. Definitely recommend the book! 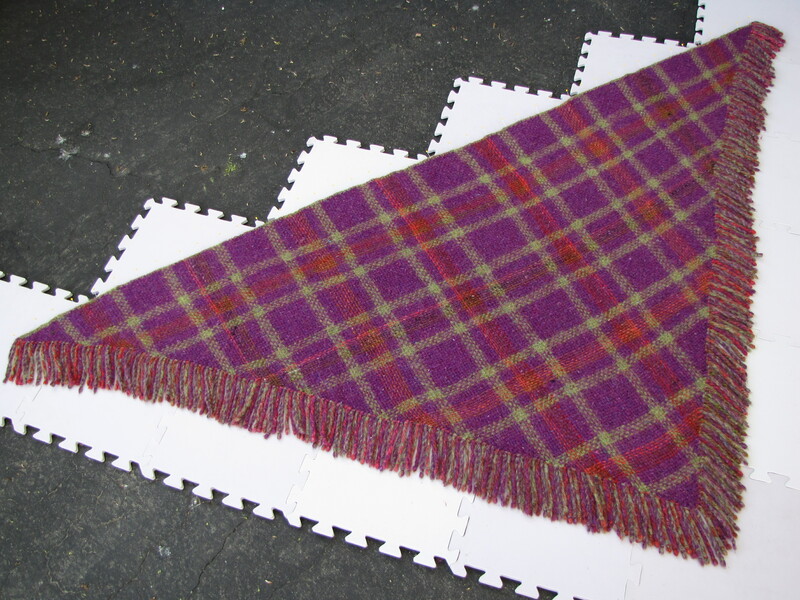 I also recommend something else they sell – a mug rug kit. For $20, I got absolutely EVERYthing I needed to make two mug rugs with the braided roving technique, save for a pair of scissors to cut the lacing thread. The roving, sewing and felting needles, clamp, felting pad, instructions, linen thread, and even rubberbands are included. It’s one of the most complete kits I’ve ever seen. If you wonder if you’d enjoy this, get the kit and try it out. Look at the rug photos in their shop. You’ll know by then if you want the book. 🙂 The basic concept is the same, but there are a few special techniques needed for the full sized rugs. 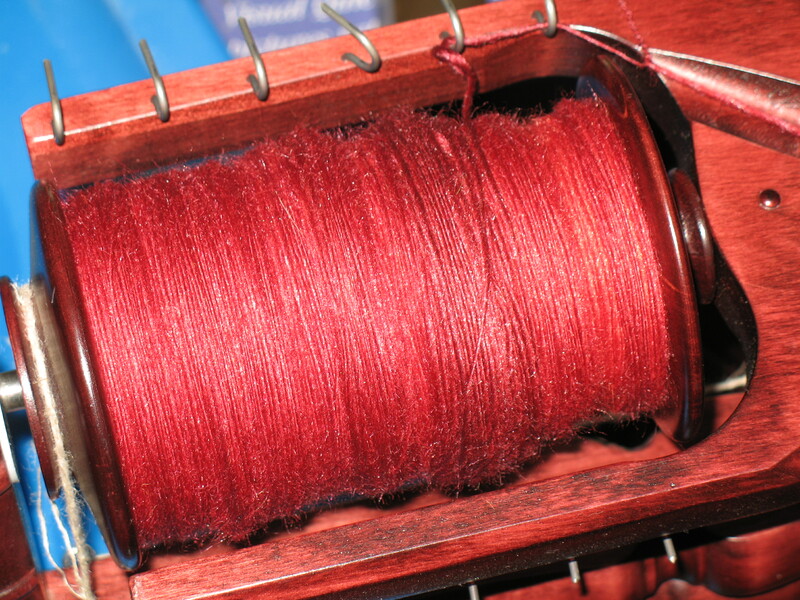 BTW, those two full spools of thread aren’t part of the kit. I bought those extra. I believe in being prepared for all eventualities. 😉 And I spent the rest of my fiber time Monday night proving it works. 🙂 And this would be why I picked up a few bits of roving at Fiberworks. I figured if I was going to be out anyway, I may as well take advantage of having some more colors to work with, so I took the kit along with me and plotted 4 rug mugs with the 6 included colors and 6 more yards from the store. What was on the schedule for Sunday? Well, first, I managed to convince myself that laundry was a fiber project, though not so very adventurous. Since the decision to wash clothes or not was directly related to whether I could attend Monday’s meeting of the Dayton Knitting Guild and canvas my LYS, Fiberworks, for stash candidates, you can probably guess what I decided. 😉 Then there were my continuing large projects, of course. I had a nice chunk of phone time, so the knitting on my newest Angela’s Felted Bag made some great progress. However, I forgot to take a picture of it before it saw Monday activity, so just use your imagination for this one. 😉 I didn’t get a whole lot done on my triloom weaving, as my back was bothering me some, but still some progress. 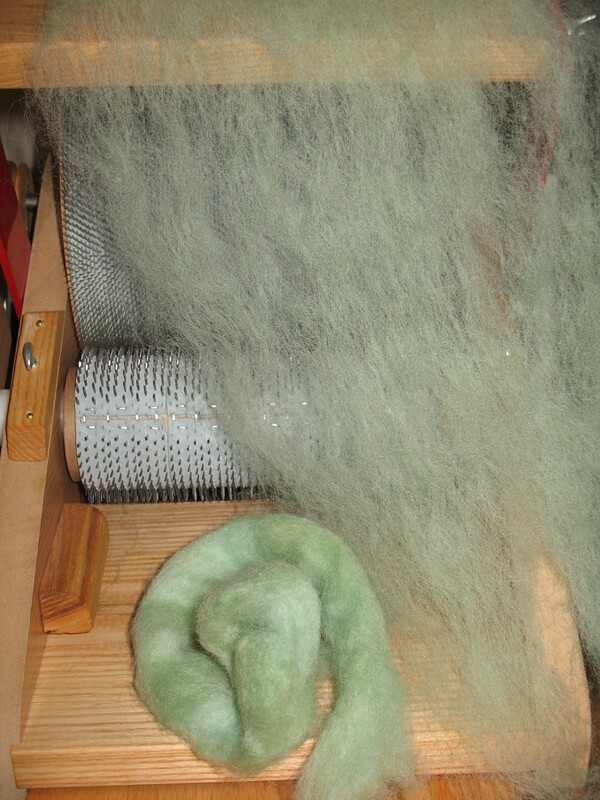 And the spinning is coming right along. The deep orange is starting to give way to red now, and I’m eager to see the full changeover soon. 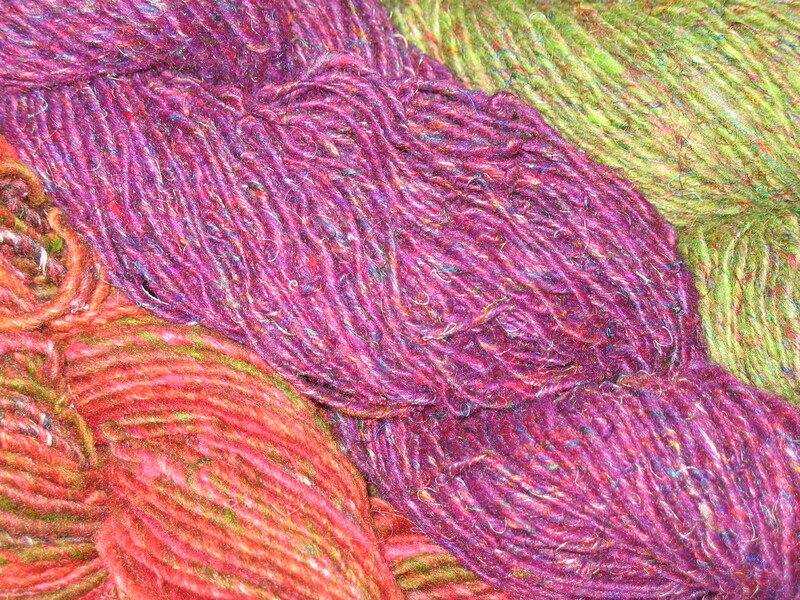 I would love to be able to fast forward to see the finished yarn, but that’s a while in the future yet. 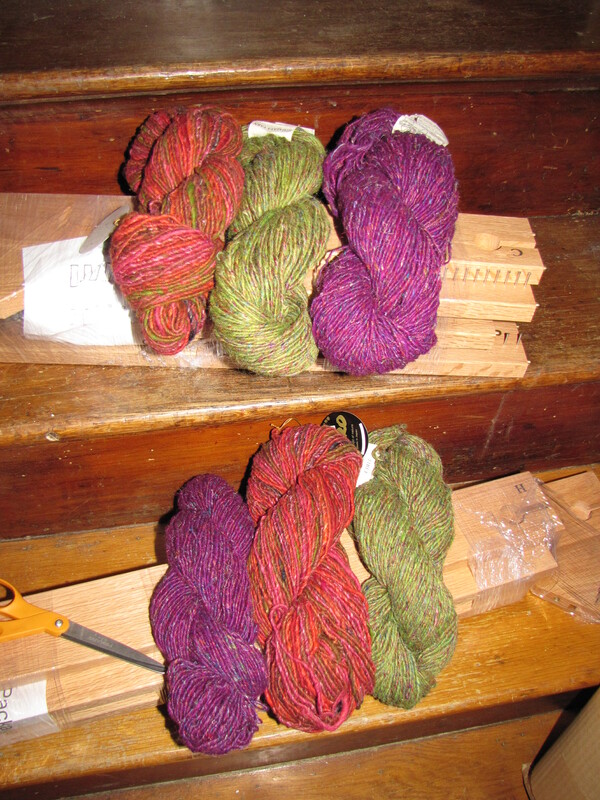 And a little bit more dyeing, as I finished the last three solids from a Dudley’s Easter Egg dyeing kit. I didn’t go beyond this today, because I’m plotting what comes next. 😉 I’m a bit baffled by the color names listed on the back of the package. The best I can figure, the green is teal and the neon chartreuse is the green. Who knows which is the pink vs. the strawberry… But the colors are fun, and I’m full of ideas. 🙂 A very important project for today is part of an ongoing adventure. 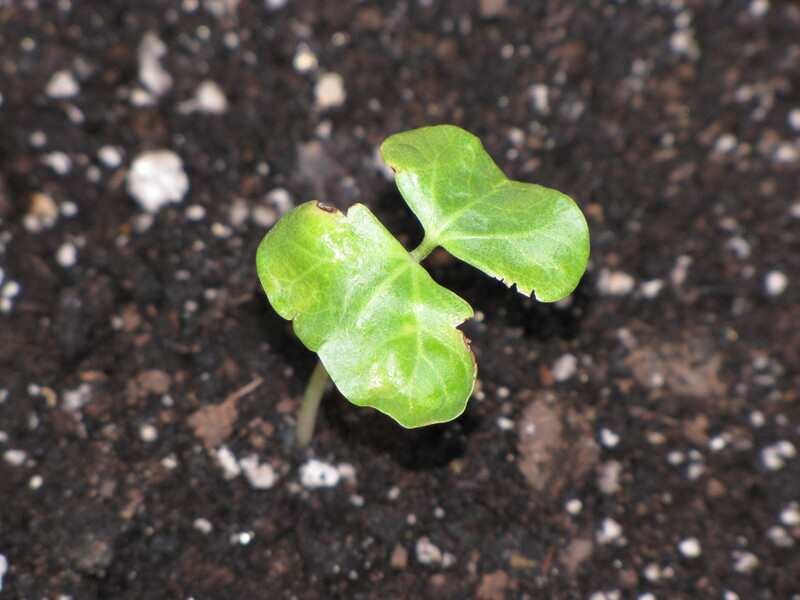 I have cotton seedlings started, a total whim. I have no idea if I can actually grow and harvest cotton here, but I’m giving it a try! I started them indoors a few weeks ago, but I have no plant lights and not the best conditions, so despite them having their little heads above ground for several weeks, I’m still not seeing the first “real” leaves, and they (along with all my other seedlings) have really been struggling. Today I put 5 of the 8 into pots, hoping this will be better conditions for them. The weather was pretty, so they got a little sunshine and fresh air as well. 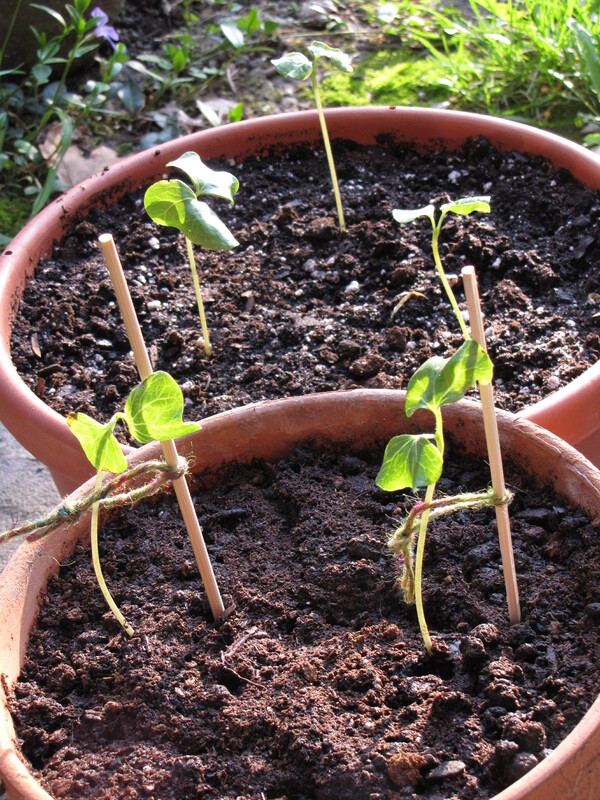 I need at least one more pot and more soil, so I can get the rest of the cotton potted. I’m not sure any of my other seedlings will survive at all, and there’s probably going to be a lot of direct seeding in a few weeks as I start over. It’s been so sad to watch them struggle indoors. 😦 My biggest adventure today was knitting from silk mawata (aka silk hankies). 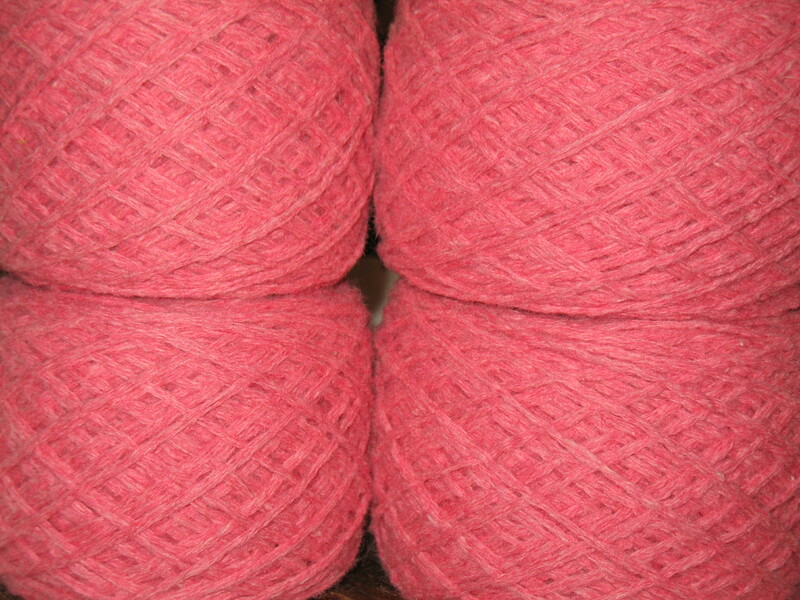 The evening that Tyg died, I was online noodling around on Etsy, and Wooliebullie had just listed a 42 gram package of hand-dyed mawata, colorway “Broken Heart.” I sort of felt like she’d put them there just for me, and I bought them without hesitation. Though I’ve bought several silk cocoon hankies in the past, I’d yet to actually do anything with them, and since this is a Fiber Adventure Week, what better time?! 😀 It’s turning out to be a fascinating process, and I’m enjoying it a lot. That would be why I didn’t get as much weaving done today as I’d expected. 😉 If you’ve never worked with this fun fiber presentation, I’d definitely recommend you try it at least once. 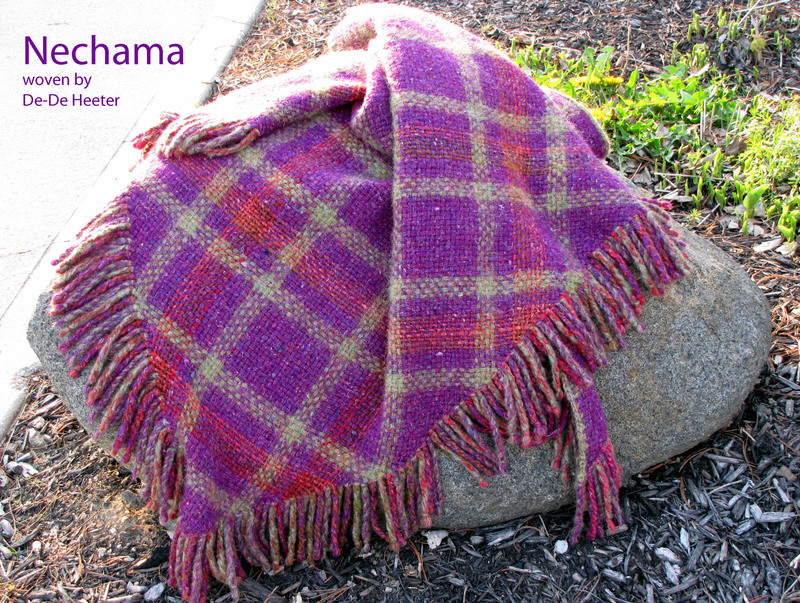 It’s a great way for a non-spinner to still be able to produce their own one-of-a-kind yarn, with no equipment required! Put on lots of hand lotion, even if you don’t think your hands are rough. Trust me on this! 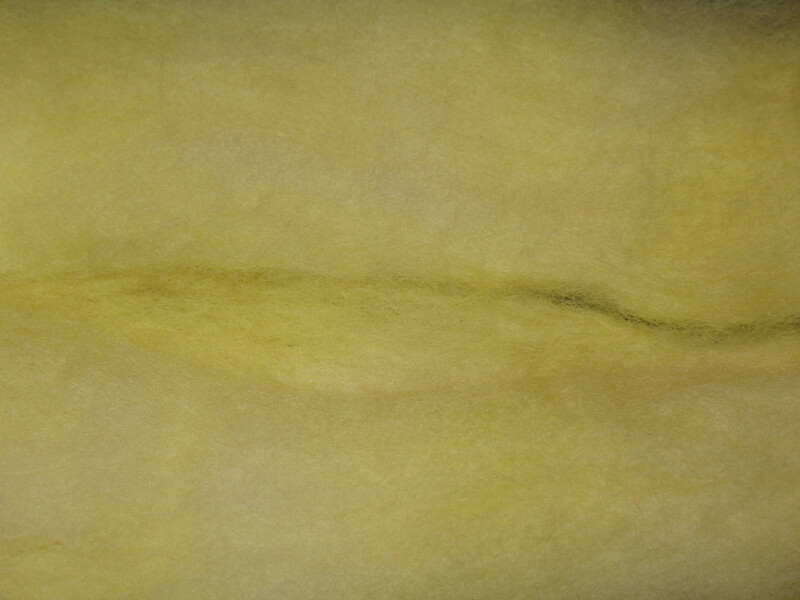 Poke a hole in the center of the silk. Put your hands in the hole and stretch the center out to the border. 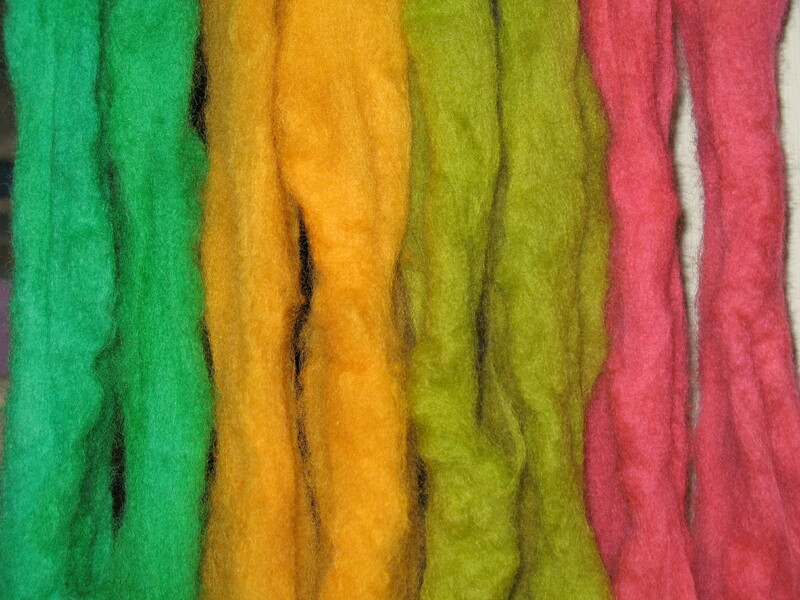 Decide how thick you want your yarn. You can stop without doing anything else, or you make it thinner by working your hands around the circle and stretching the fibers apart as you go. You will need to have your hands farther apart than you’ll probably start with, and you’ll have to pull harder than you expect. 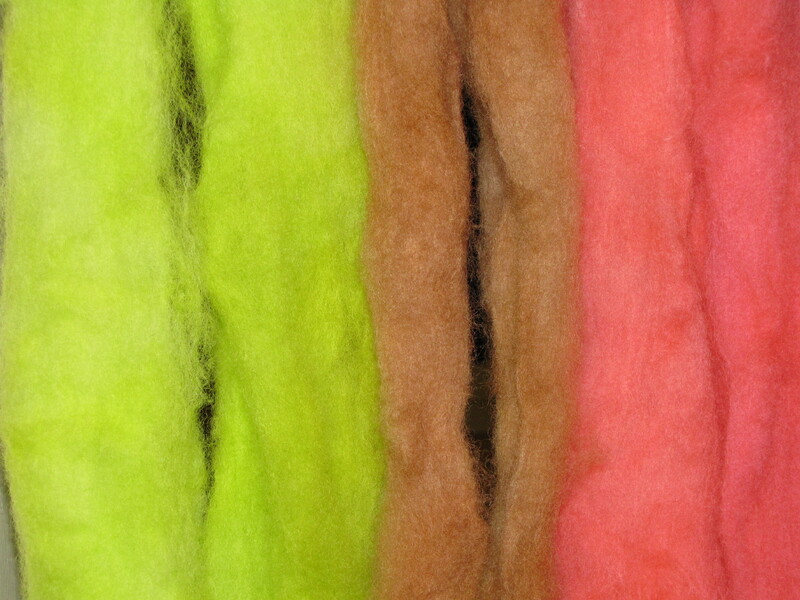 Silk is a very strong fiber! Plan to go around the circle several times, thinning the thickest spots and being careful not to break the ring. Remember, you don’t have to achieve perfection. 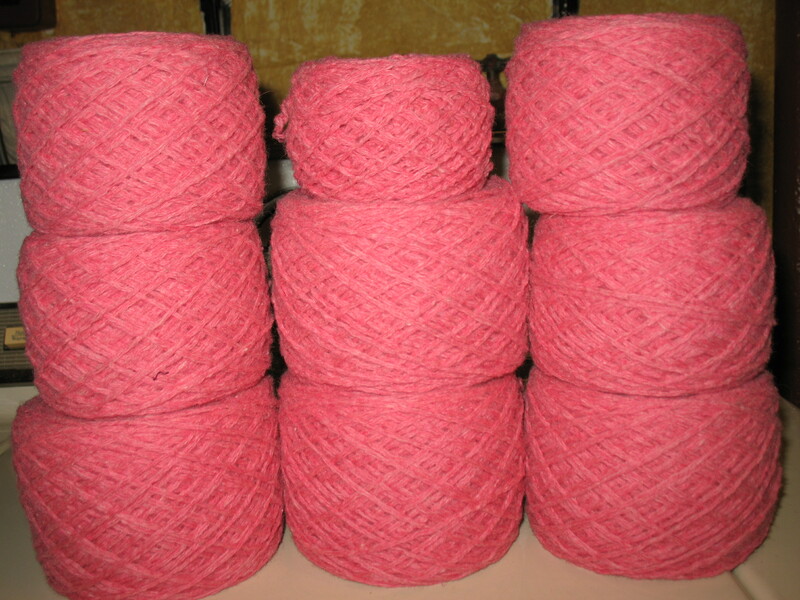 The variations in thickness add character to handmade yarn. 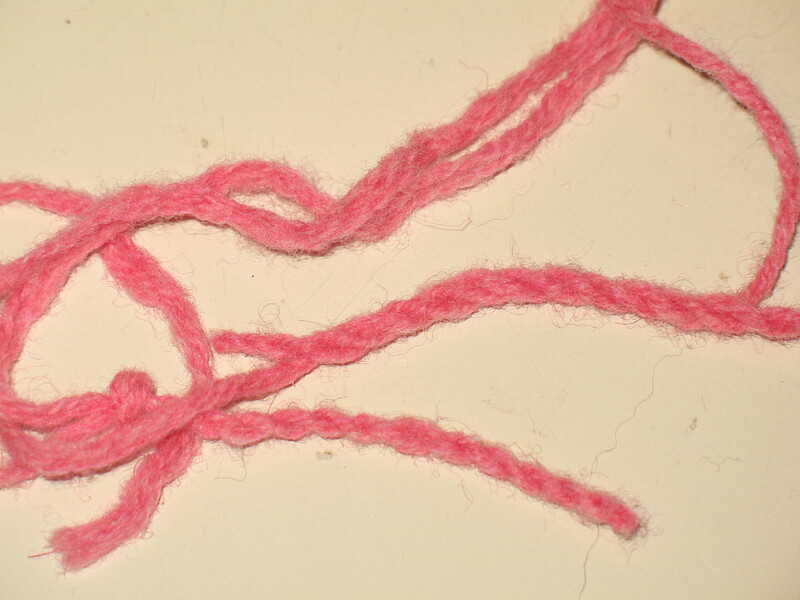 When you are satisfied with your yarn, break it on one place. I’ve chosen to stretch my hankies until they are pretty close to 3 yards of total fiber, and I’m knitting on size 2 needles. The fiber is fluffy enough that it actually also worked on size 8 needles, but I found it challenging to work on circulars with it. It didn’t like jumping the hump, and I finally ripped it out. The size 2 needles are the largest metal DPN’s I could find on short notice, so they won by default, and I’m liking the fabric I’m achieving with them, too, so it’s a go. 🙂 The photo above shows 5 filmy hankie layers knit into a tube with a cast on of 40 stitches on US 2 needles. 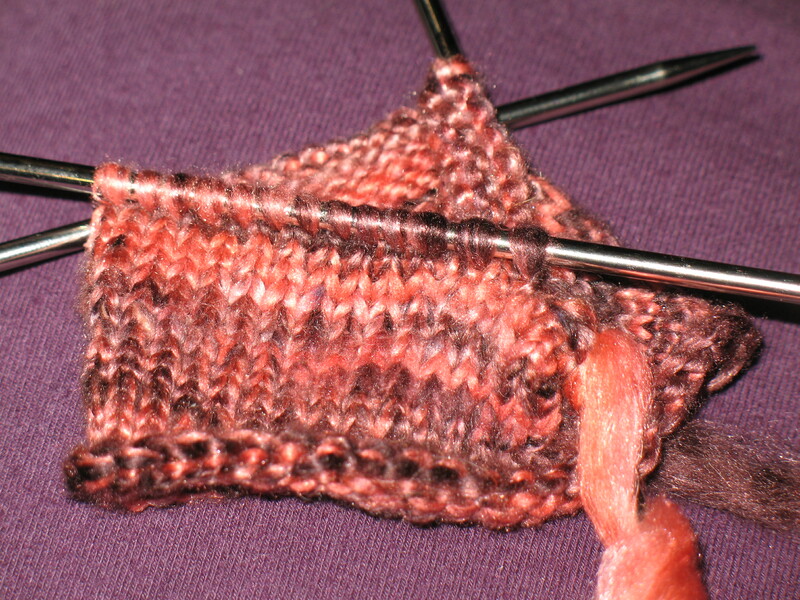 It’s already over 1.25″ of knitting. 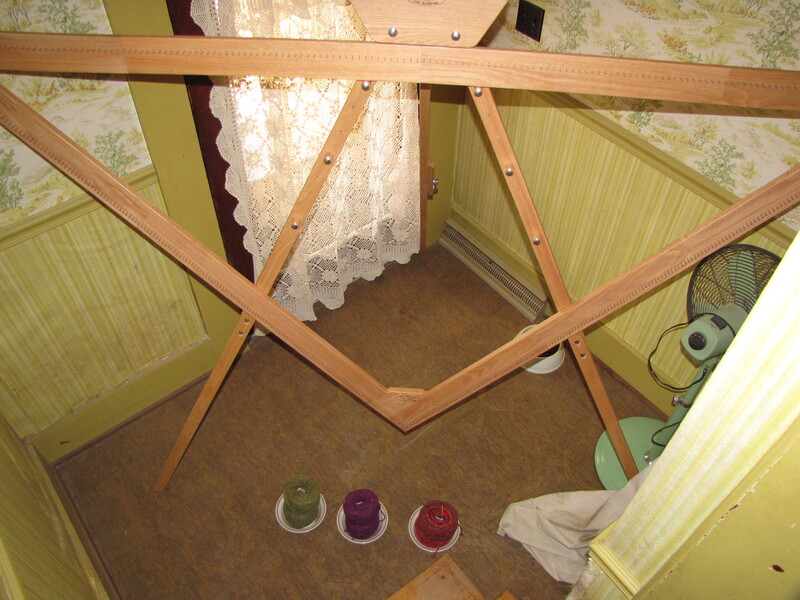 Just so I’d have something that was relatively comfortable and predictable, not to mention the loom was still up and tempting me mercilessly, I started a new triloom project using – GASP! 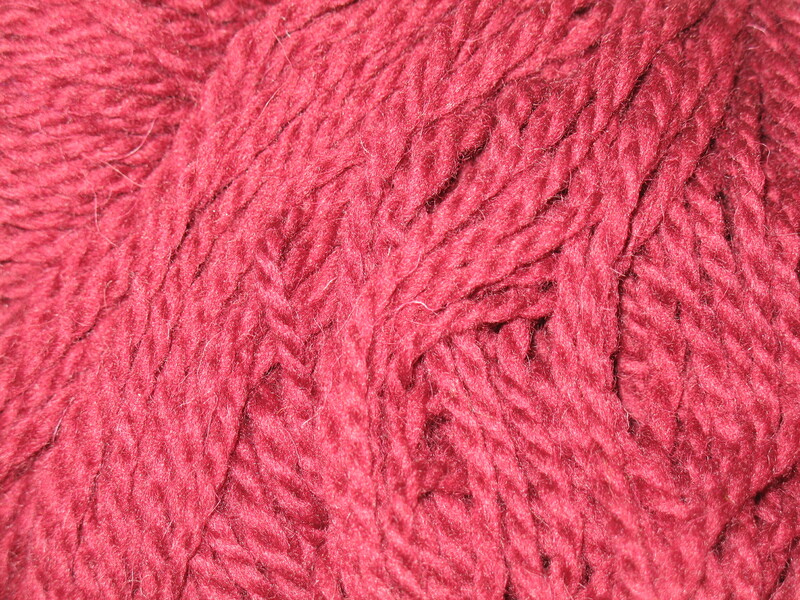 – a single, solid colored yarn, Cascade Eco + in a yummy burgundy. It comes in 8 ounce hanks, which are too large for my very average ball winder, but just as I started to moan about having wind by hand, I realized I could use my ball winder to go as far as it would, then finish the rest by hand. Whew! I’m using it double stranded on my 7′ loom from Dewberry Ridge. The next project on the schedule has been dangling for a couple of months. 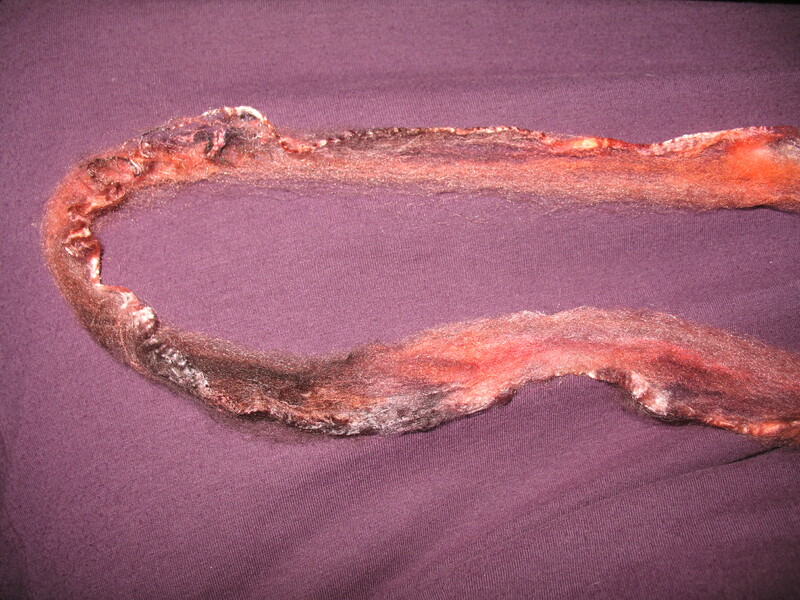 Back when I snow-dyed the one and only time this past winter, I grabbed some of that corriedale roving and gave it a quick baptism in the run off dye in the wash tub, then finished it in the microwave. This gave me some interesting, soft colors and kept me from feeling like I totally wasted quite as much of the excess dye. 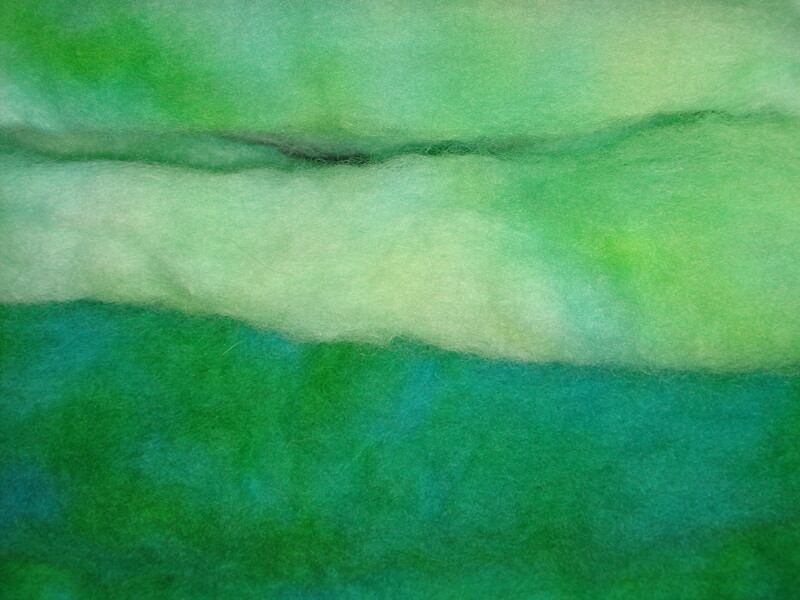 I quickly envisioned making batts using the soft brown and soft green along with some white silk noil and dyed wool nepps, entitling my creation “Snow in Spring.” It was beautiful in my mind! Of course, I’d sent all of a couple ounces of fiber through my drum carder the entire time I’ve owned it, so I qualify as totally clueless. The night I thought I was going to whip all this up is the night I’d discovered that they don’t call it a petite for nothing. I divvied everything up so that each batt had 2 ounces of fiber, and I quickly found out that my little machine choked to death on half that much. Oops! 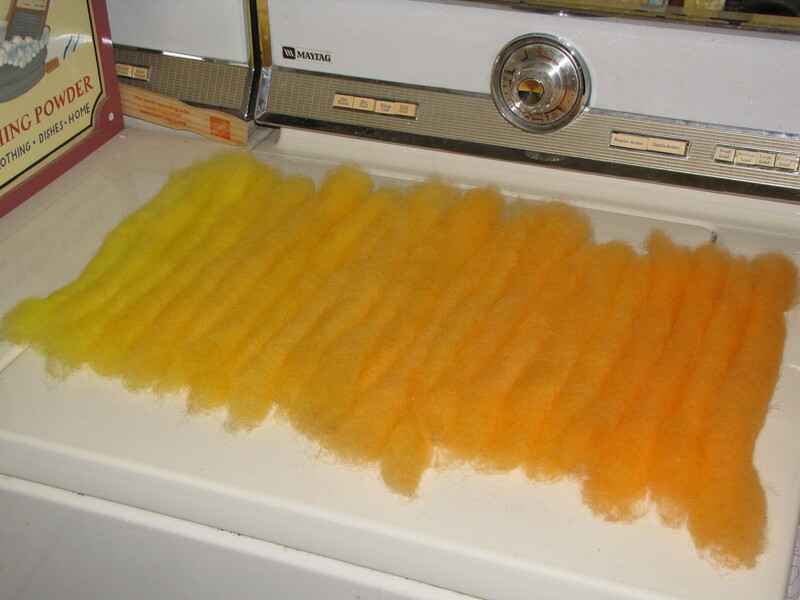 By the time I discovered my “few” batts were actually going to have to be about 25 batts to use up what I’d dyed, I was done in for the night, and the stuff has been in the tote untouched ever since. 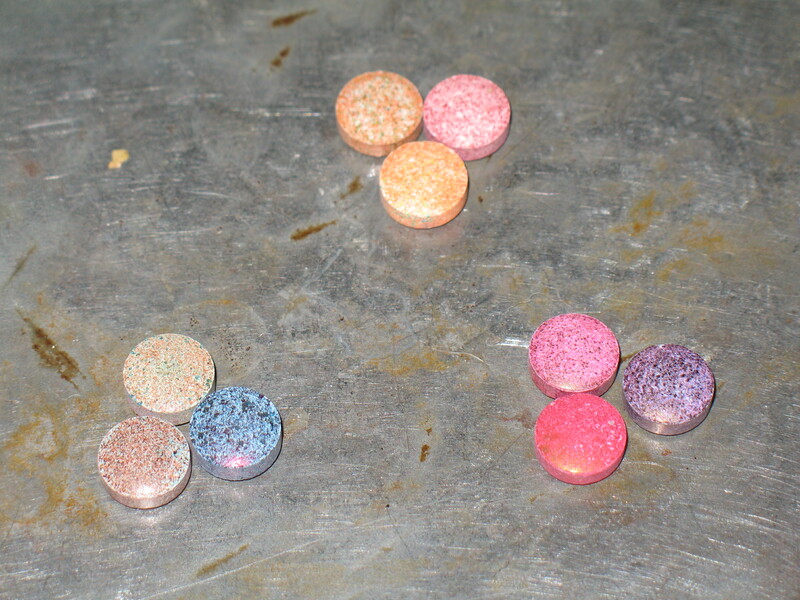 First step on Friday was to weigh some of the components down into smaller, even quantities. 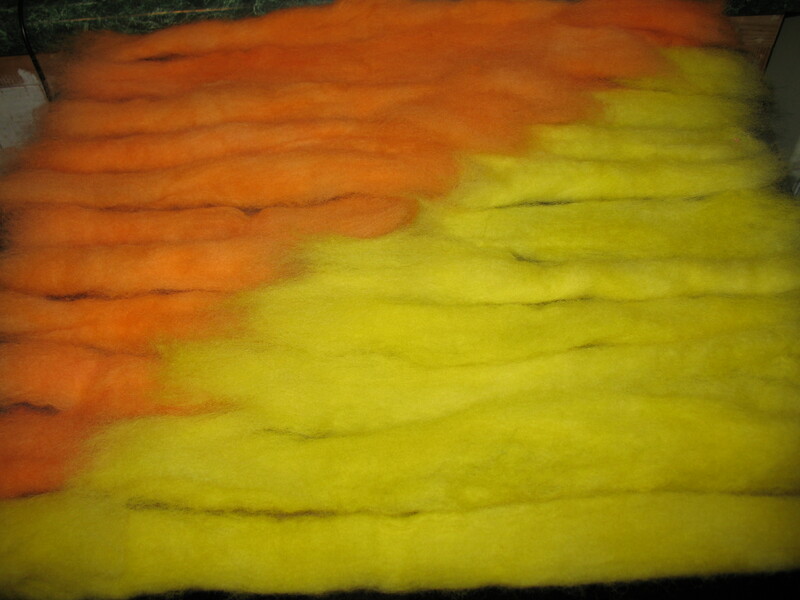 Next, I started working on the somewhat compacted corriedale I’d dyed, turning into fluffy fiber again. 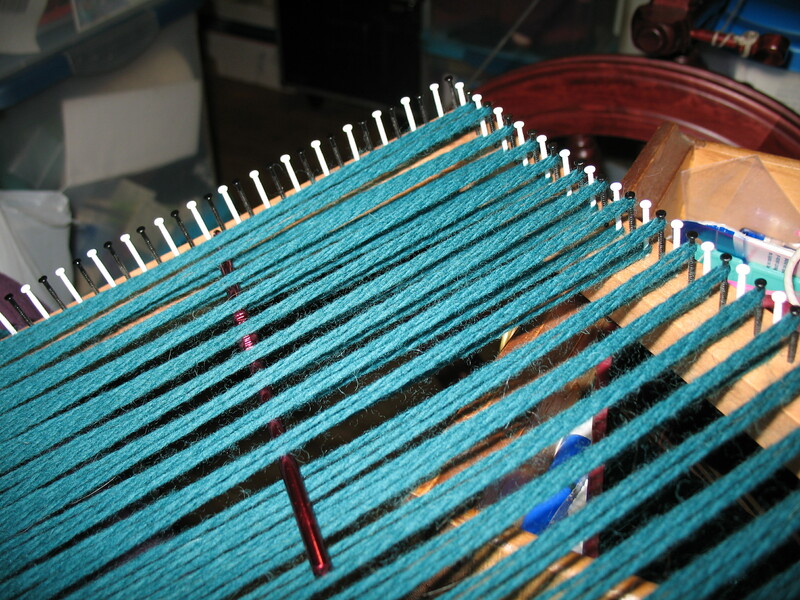 Then I spent a LONG time learning more than I thought I didn’t know about carding, but by the time I tried the third stack of fiber, my education was sufficient enough that I produced a usable batt – half the size of even my greatly reduced version. 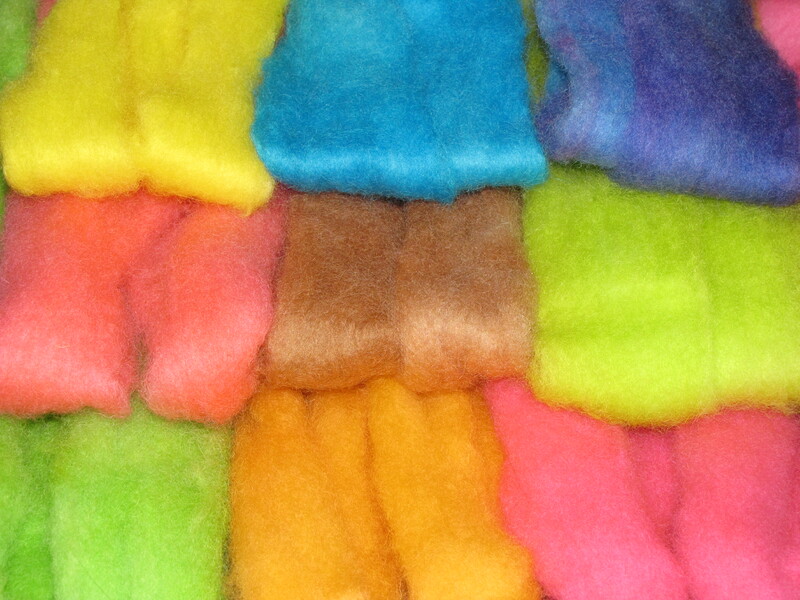 This would mean a total of 50 little batts from the fiber I dyed. Methinks this is going to take a while… so… before I committed to the other 44, I figured I should spin what I’d just made to see if it’s worth it. 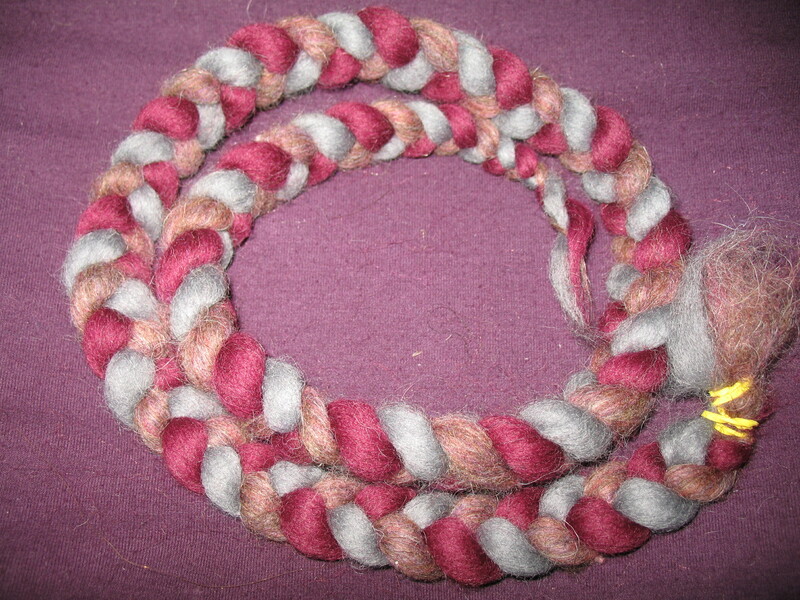 (Chanting Fiber ADVENTURE Weekend…) In the spirit of being a good girl, and because I HAVE to learn to spin woolen as well as my much enjoyed worsted if I’m going to pass my Master Spinner Certification, I spun one each way. 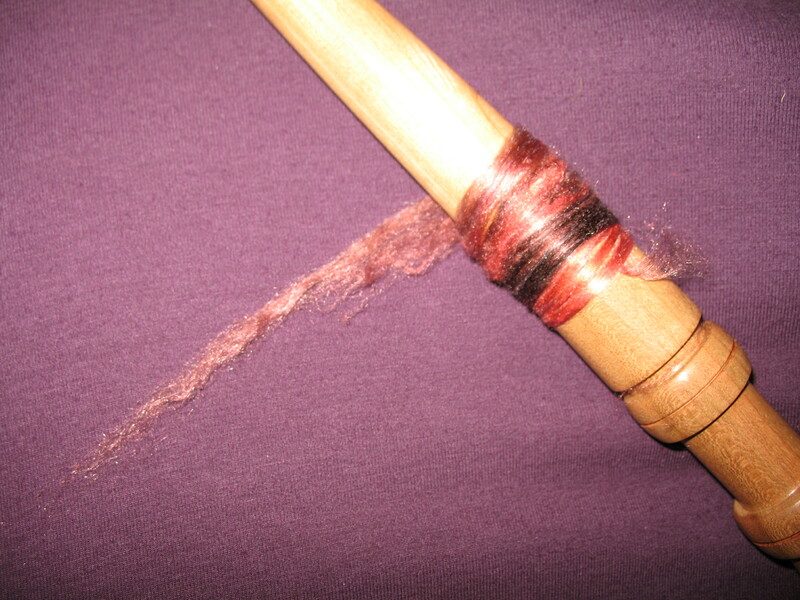 Suffice it to say, I have a LONG way to go before I master woolen spinning! 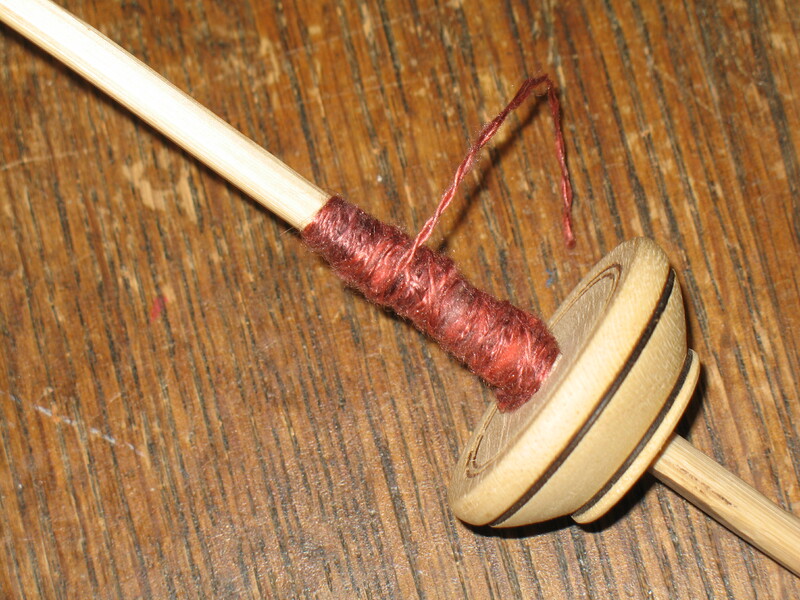 In my defense, this was the first time I’ve been able to spin since the beginning of November, this wasn’t easy fiber to spin, I’ve only spun a few yards woolen in class, and that reduced me to tears, AND lumpy, bumpy yarn has never been my forte – even when I spun my first skein. I really didn’t need to label which was which, did I? 😉 It’s pretty awful! But anyway, what do you think? Make up the rest of the batts? And does anyone have any tricks to keep the nepps in the fiber instead of raining into my lap as I spin? Two weekends ago, right before Tyg died, I was being suffocated by stress coming at me from many directions. It struck me on Friday evening that what I really needed badly was a retreat – right then and there! Whereas it was totally illogical to run away from home, no matter how badly I wanted that, I realized that since hubby was going to be gone all day Saturday, I COULD do a retreat of sorts – just do it here at home. First step was to become an activity director. What should I do on my retreat. I decided that I needed to find something that was entirely outside of my current, normal pattern, so it would keep my brain occupied. On the other hand, it needed to be simple enough not to require TOO much brain, because by that point, most of the matter between my ears was largely marshmallow. And, since I was cheating in a way by running away from so many important things I should be doing, I thought it should be something purposeful. Of course, it goes without saying that it had to be something enjoyable. One doesn’t spend a retreat cleaning toilets and balancing bank statements. It really didn’t take me too much effort to figure out that my retreat project needed to be either spinning or weaving, and since my new triloom had just arrived the previous Monday, and the week before that, I’d bought some gorgeous yarn that wouldn’t leave me alone, the weaving won. 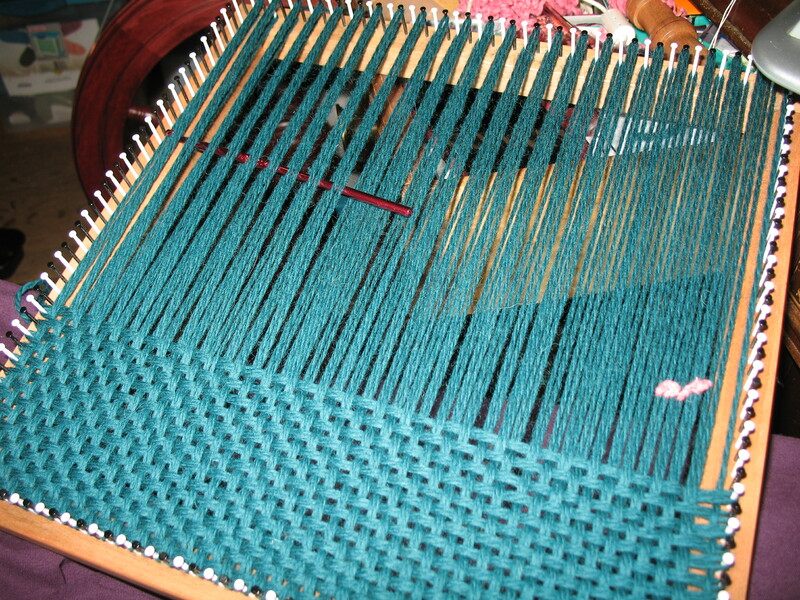 It’s tough to feel impossibly guilty weaving a project that will result in a 2011 goal being marked off my list, too. 🙂 After spending a couple hours Friday night pushing ideas around, I came up with a color balance I loved. I love the ease of planning plaids here. 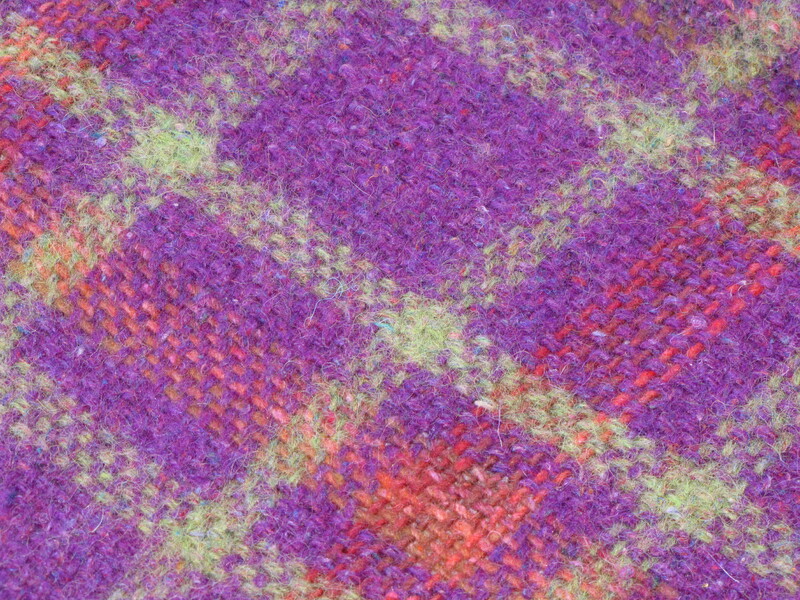 I must confess that despite the fact that this was to be the first thing I’d ever woven beyond baskets and my childhood passion of potholders, I’ve spent more than a few hours designing some lovely fabrics on that tartan site. It really helps me see what I have a tough time imagining otherwise. Must be attractive – nice color, lovely finish, and well built. I love wood… but I don’t love fake wood or poor quality finish. And this had to be built to last. I wanted to buy it once. Period. Must have a matching stand. I simply have NO wall space around here. Should be easy to store. This is where the fantasy bit started. I don’t have a place to store a 7′ triloom, even if it was in three pieces. 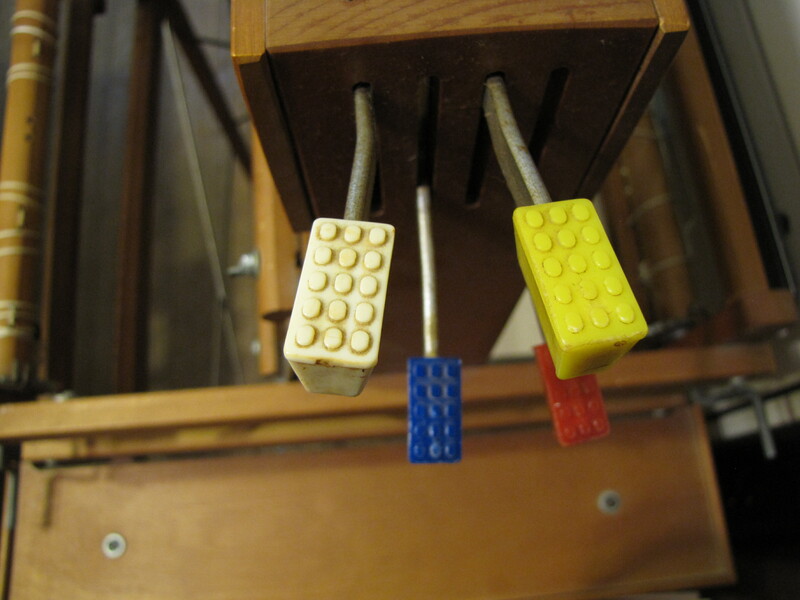 In fact, this was a very large part of why I didn’t already have a triloom. And after all this, it had to be affordable. 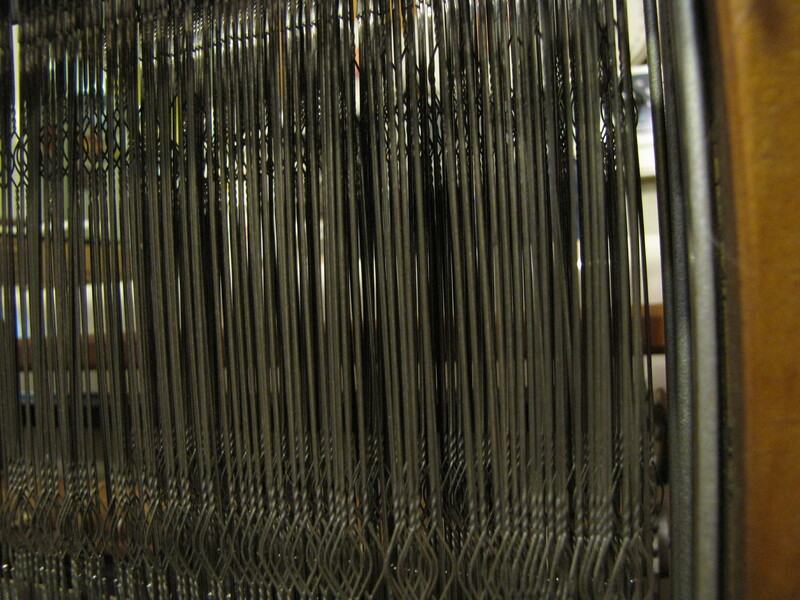 Some of the prices I’ve seen on the larger looms made my eyes water. I THOUGHT I’d like this type of project, but having never actually done it, I wasn’t positive. The less I had to spend, the better. Of course, with the previous four items on the list, this was a total laugh! One thing I’d done a few days earlier was swatch the purple yarn and wash it, trying to get an idea about how it might soften and how much it would shrink. I have to say here that despite really liking this piece, it did feel more like burlap than anything else. 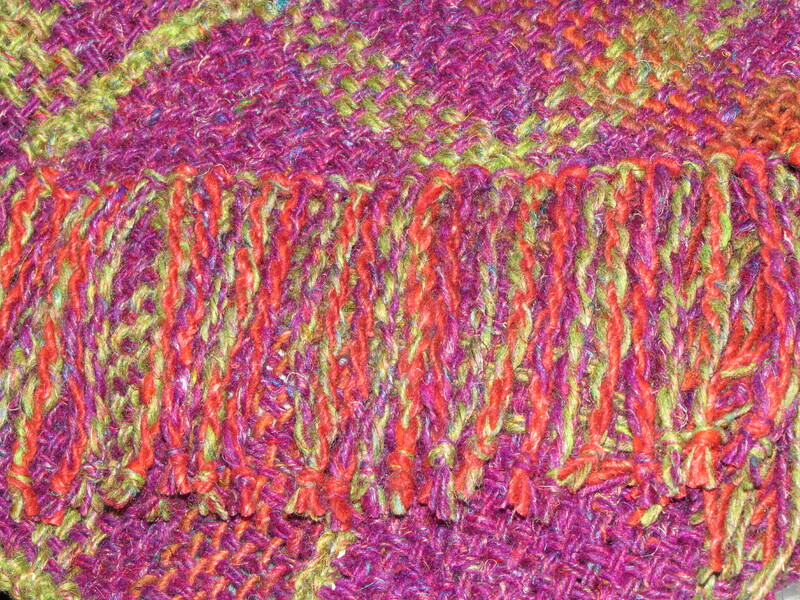 (I also discovered as I worked on the fringe that my finger was prone to go right through the weave – not good…) This yarn has no bounce, and it’s moderately tightly spun out of wool that is definitely not merino. 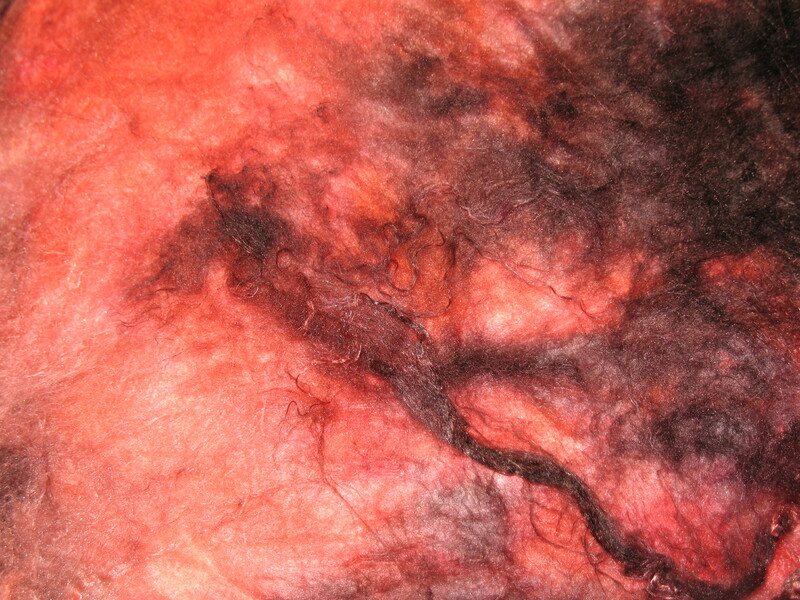 The swatch didn’t shrink much at all, it softened up a little bit, and much to my surprise, it bled like crazy. I’m SO glad I swatched and washed! So, the detail stuff… First of all, no, the difference in color from the early pix to the last few has nothing to do with the dye loss during washing and fulling. The final photos are the fairer depiction of the actual colors. No matter what tricks I tried, I couldn’t get an accurate rendition of the colors indoors. Think royal purple and medium olive in the Tibet, and burnt orange variegated for the Iro. 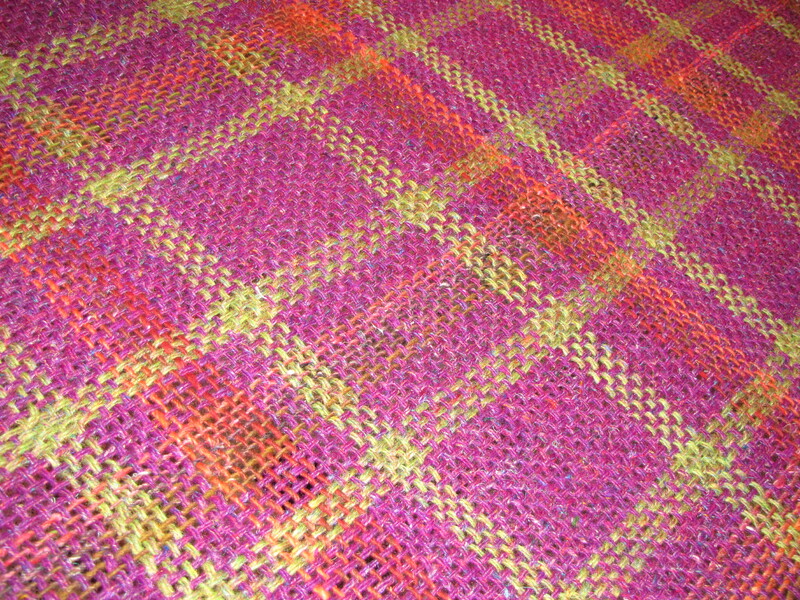 Full details regarding amounts used and other knitty gritty about the weaving are on my Ravelry project page. And since I’ve already been asked several times, Nechama is a Hebrew girl’s name meaning “consolation; comfort.” Making this shawl has served me well in this regard, easing the last few days of Tyg’s life and my first week without him here. I’m happy to have something so special coming out of these twelve days, and I’m glad for the memory of Tyg supervising my first triloom weaving. I’m sure if he were still here, he’d be looking for a way to usurp it for a nest right now! 🙂 And lastly, yes, I just marked the second item off my 2011 goal list. Yippee!!! 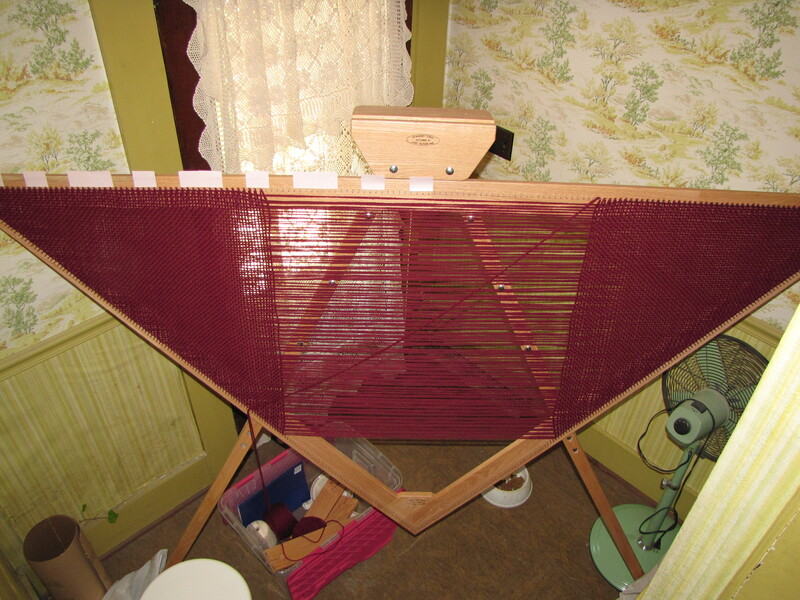 A few weeks back, one of the women on a fiber groups I enjoy on Yahoo posted that she had a LeClerc Dorothy table loom and folding table for sale. Wow! A 4-harness loom at a price I could handle – and with Christmas money in my pocket! No, I simply couldn’t resist. 🙂 I fired a check off to her and settled in to wait impatiently for my new toy. Noodling around online looking for info, one evening I found myself on Craig’s list. 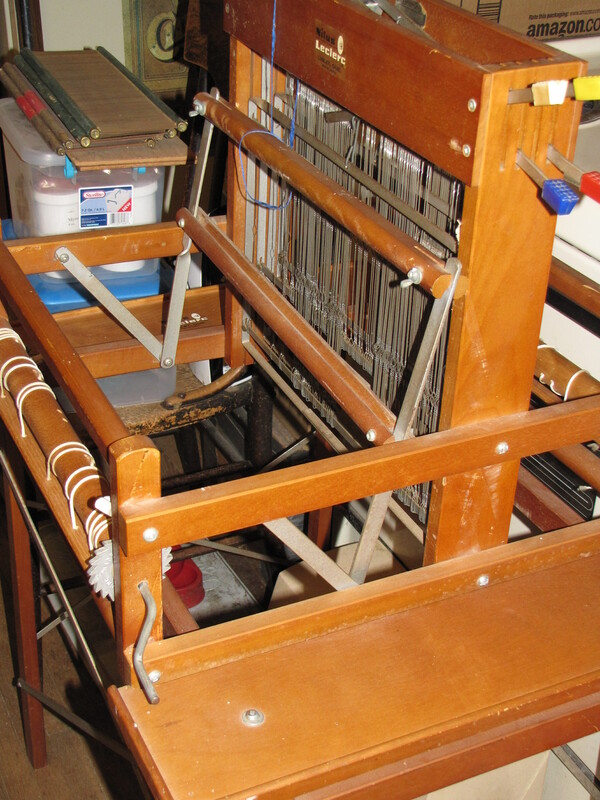 I got to wondering if there was any chance I could find the big triloom I’ve been wanting, but instead of that, I discovered a 36″ Harrisville Designs floor loom for sale in the next town north. Dare I? I mean, how crazy would it be to get both? I don’t have room for either at the moment, but… well… I went with a friend to look at the floor loom Wednesday, and it sort of followed me home. 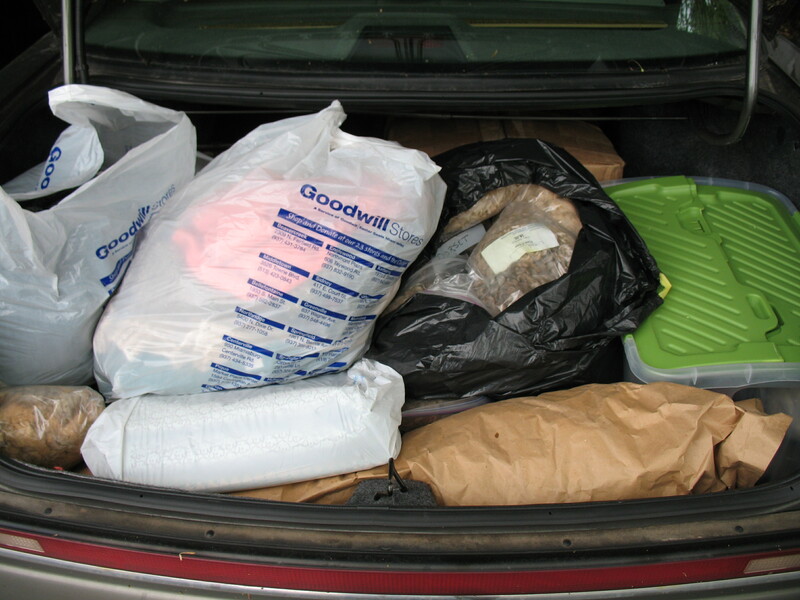 It was a great deal, as she sent along the warping mill, a bobbin winder, and two tubs full of warp thread, mop yarn, and fabric strips for rug weaving, too. We spent the rest of the afternoon rearranging things just so I could have it in the house, and thankfully I figured out at last how to fold it. 🙂 Of course, what I want to do is figure out how to weave on it! Meanwhile, FedEx showed up at my door a day earlier than they’d predicted – late Wednesday afternoon while we were still untangling rag rug fabric strips – with a 41 pound package. Yes, I ended up getting both looms the same day! It’s a bit mind boggling, to be quite honest, and my choice would have been to spread out the excitement over a bit longer time. Little Dorothy folds up ever so much smaller, even with her table, and she’s going to be my first playmate for sure. I’ve got some big work to do before I can work on something as large as a floor loom, but the Dorothy sets up in a space smaller than a card table. That I should be able to manage fairly soon. She brought some lovely yarn along with her, so my biggest challenge at the moment is to arrange space and decide exactly what I want to weave. 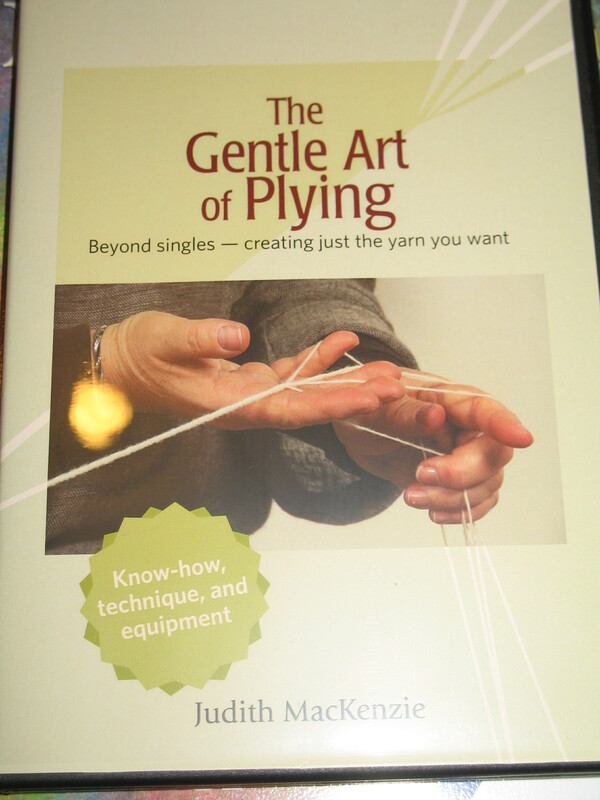 I’ve been busily ordering books and DVDs to help me get started, so I know what I’m going to be watching during knitting time this coming week.